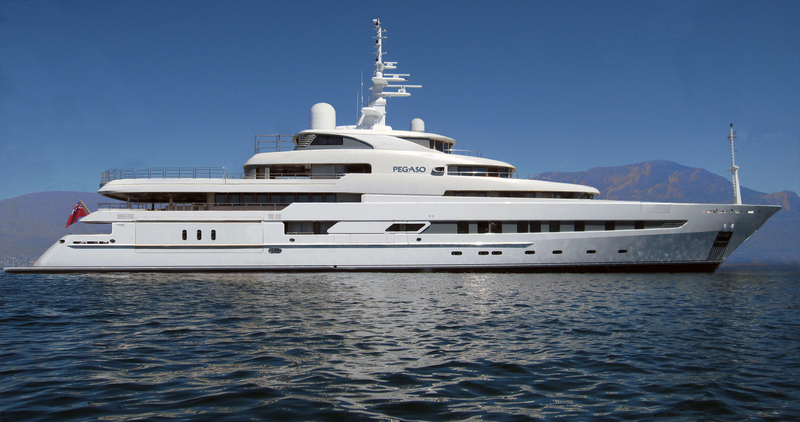 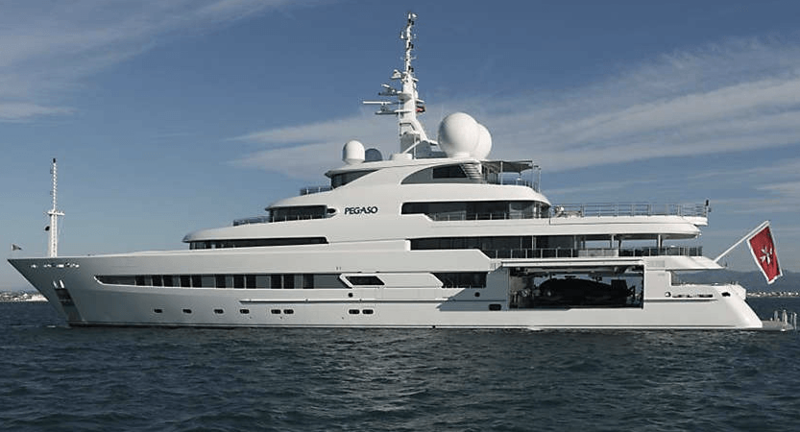 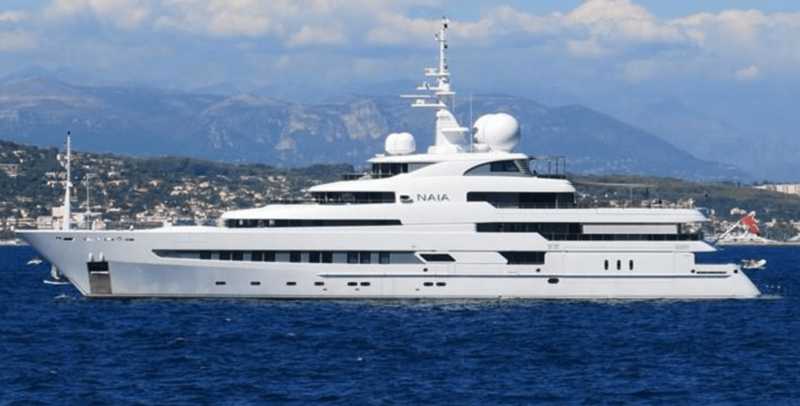 NAIA (ex Pegaso) is a 73.60m (241.47ft) private research expedition yacht, built by the Spanish P. Freire de Vigo Galicia Spain shipyard. 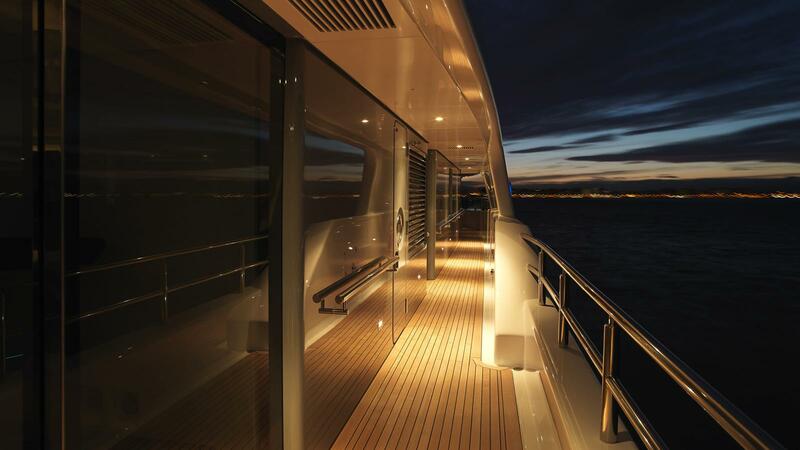 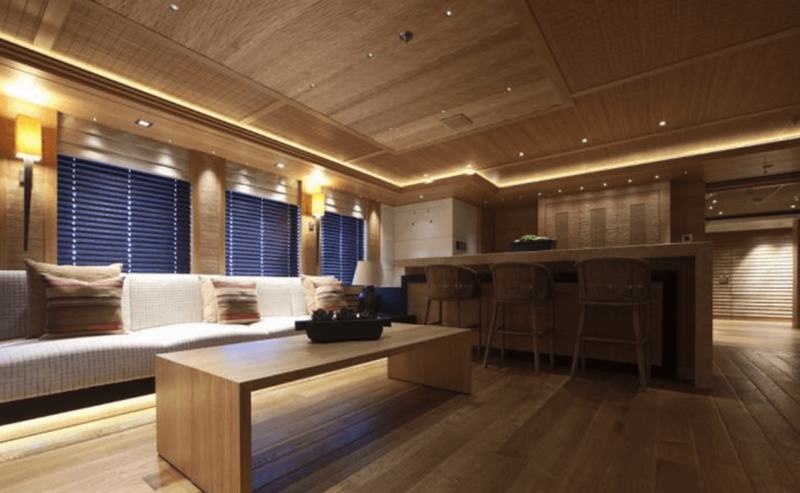 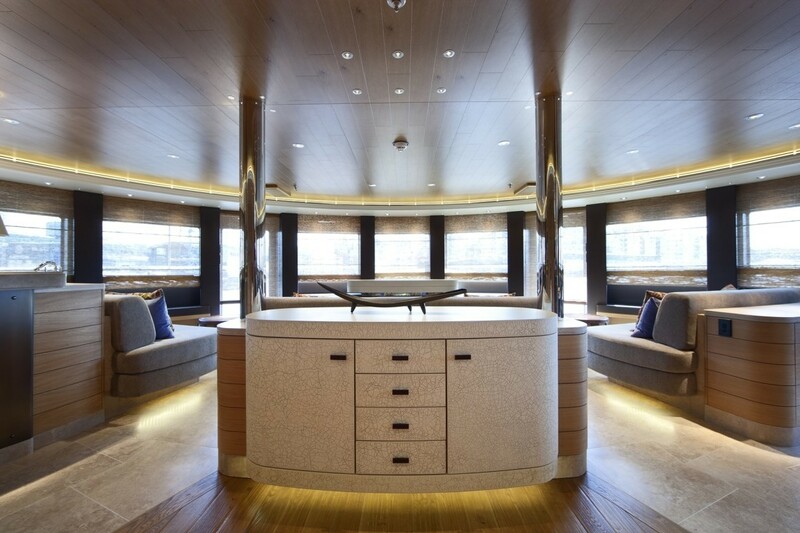 The 2011-launched superyacht features naval architecture by BMT Nigel Gee and Associates, exterior design by H2 Yacht Design and interior design by Mark Berryman. 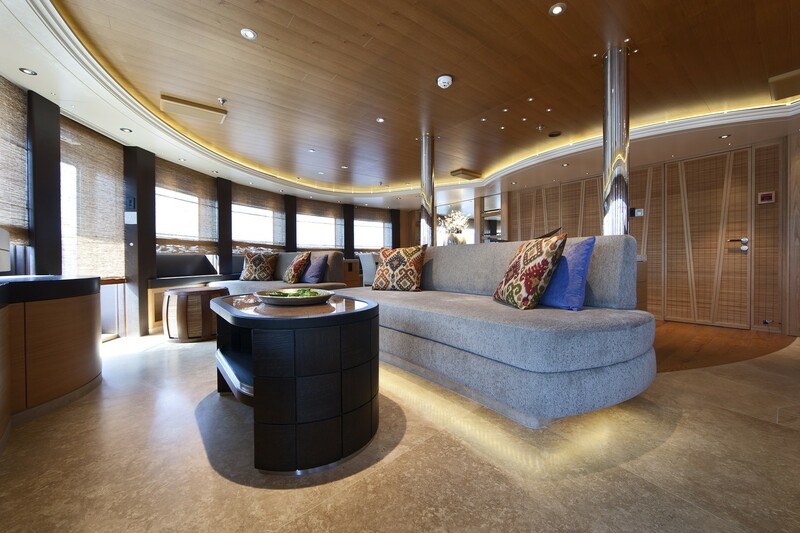 NAIA has also received a refit in 2014. 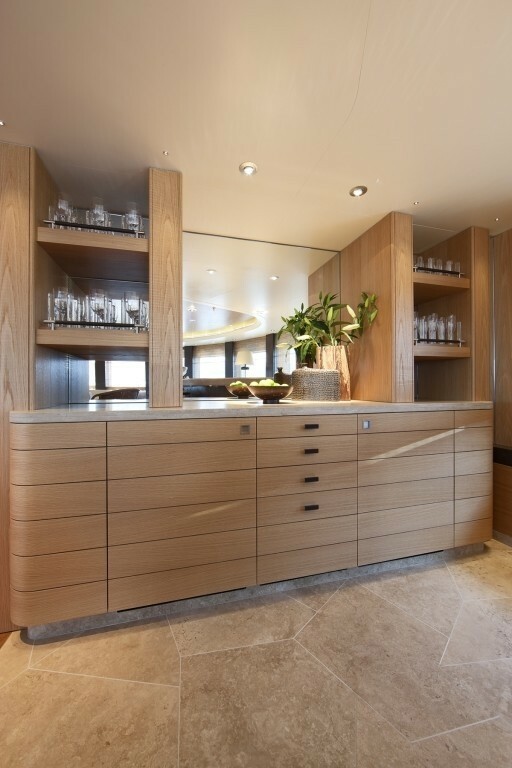 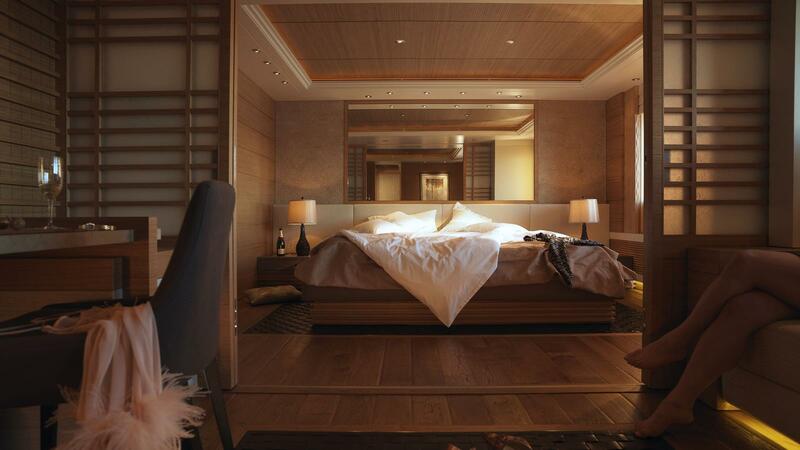 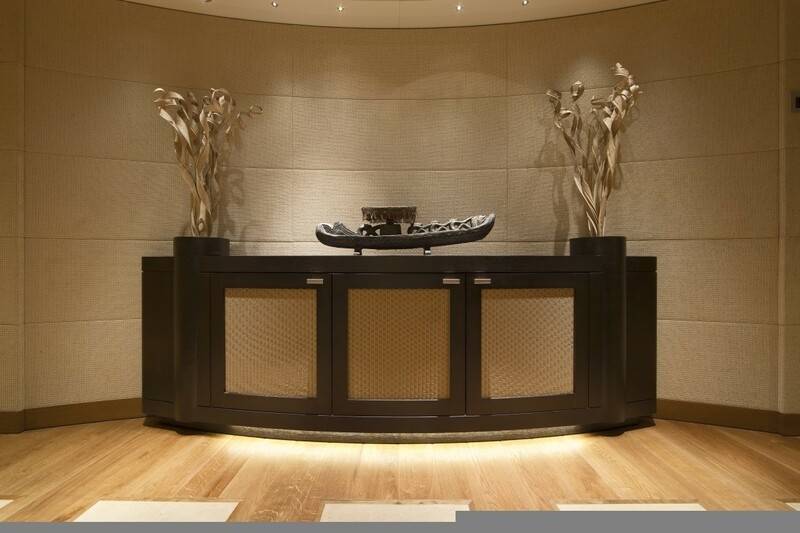 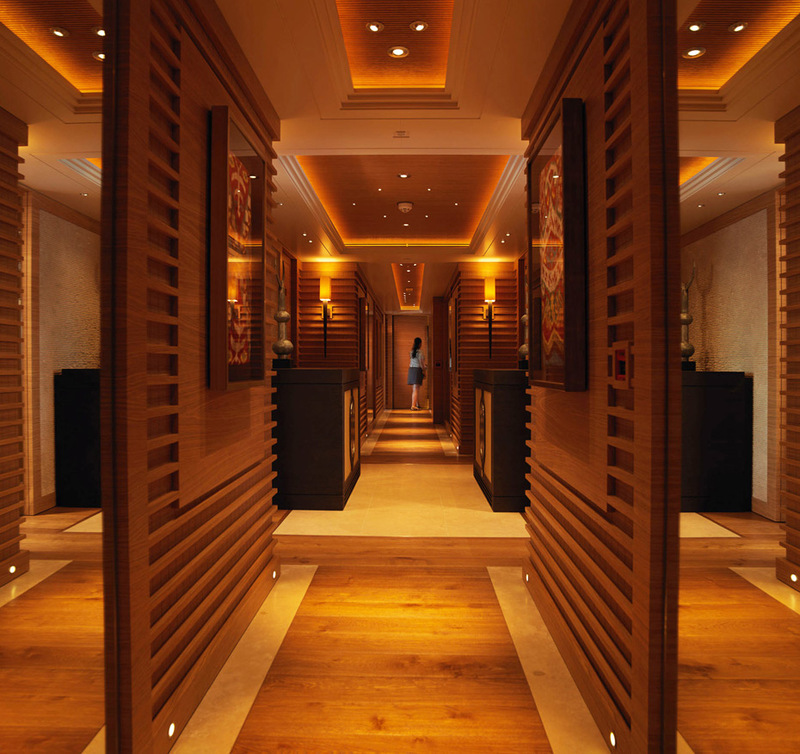 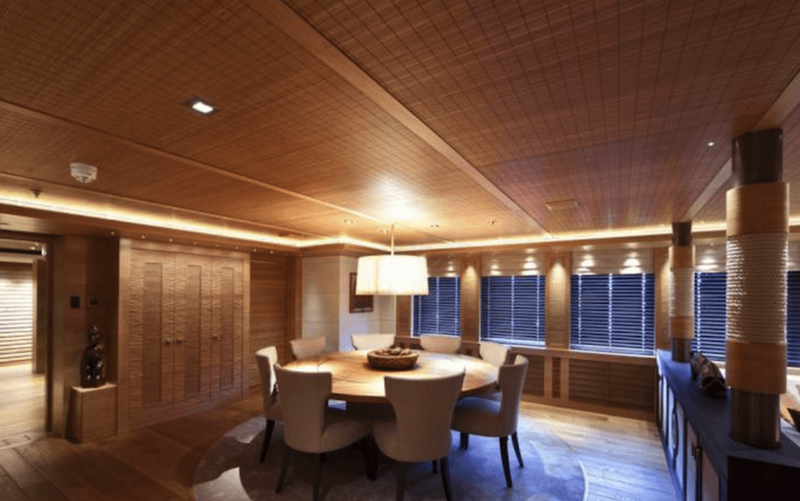 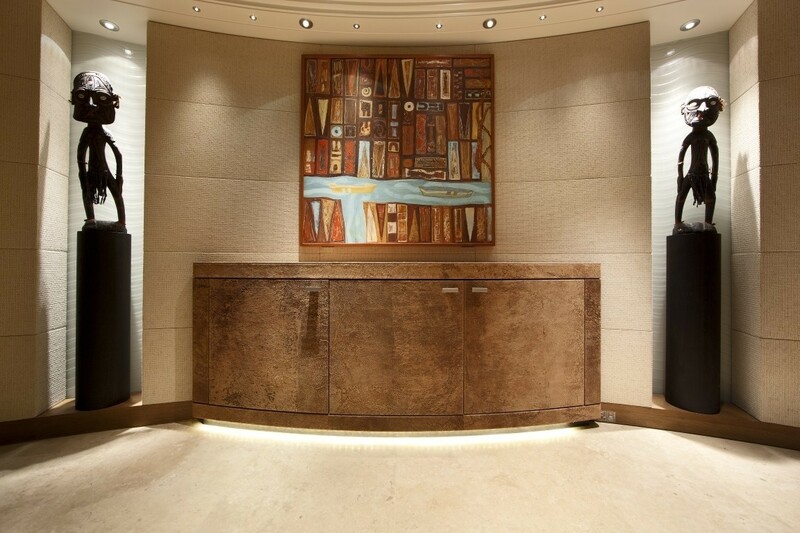 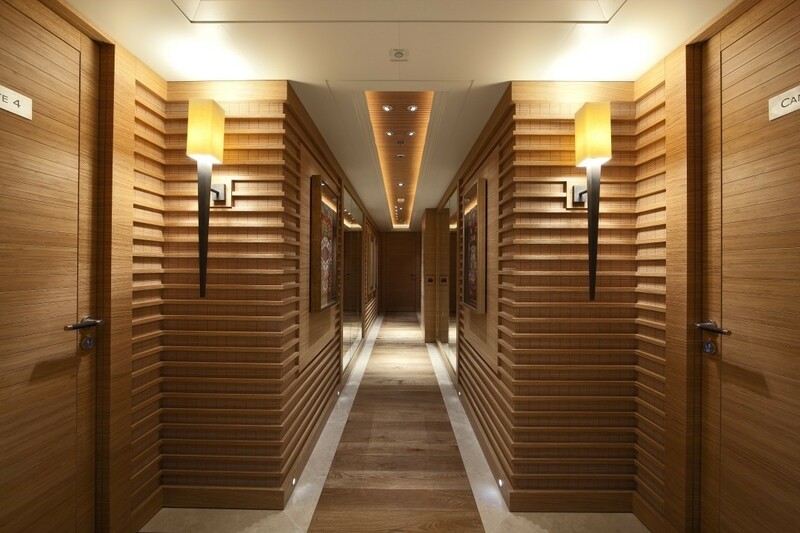 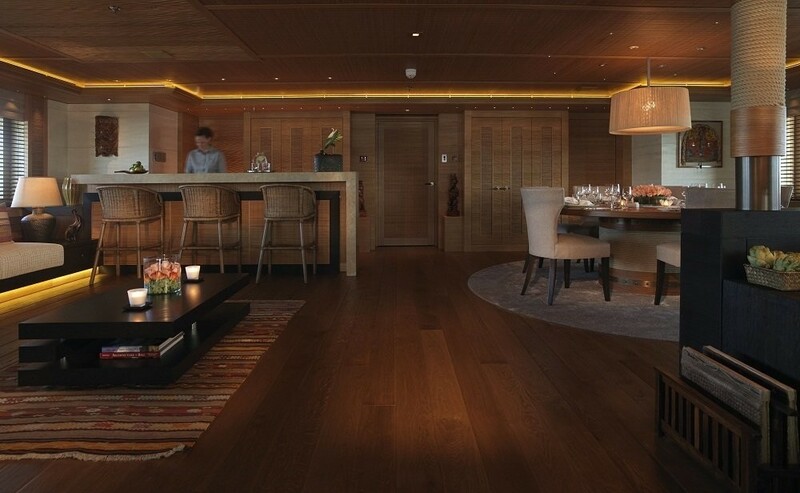 Her beautiful interior features oak and walnut, as well as soft furnishing, which creates calm and relaxing atmosphere. 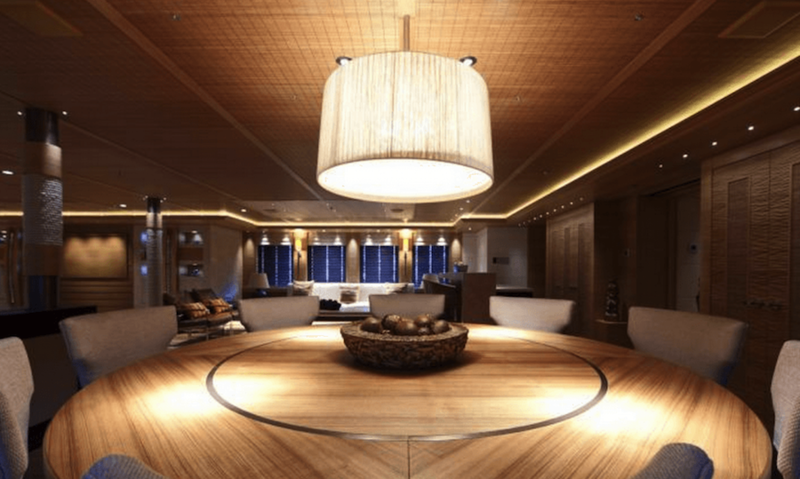 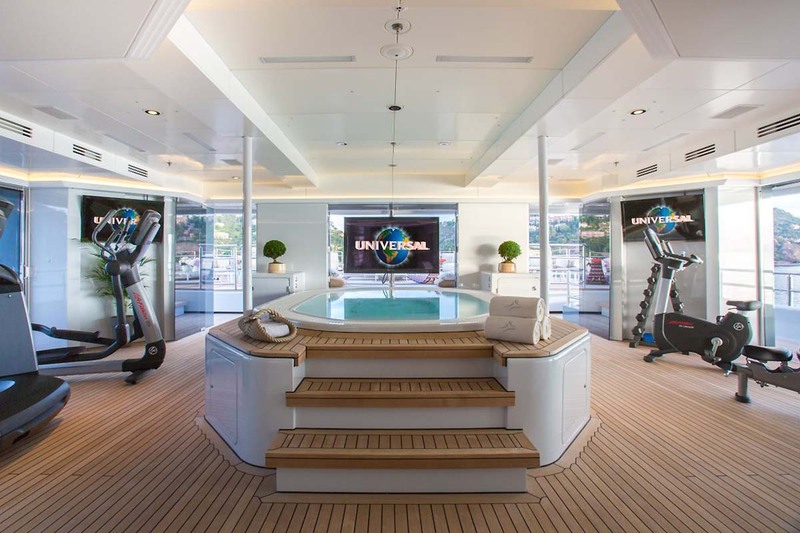 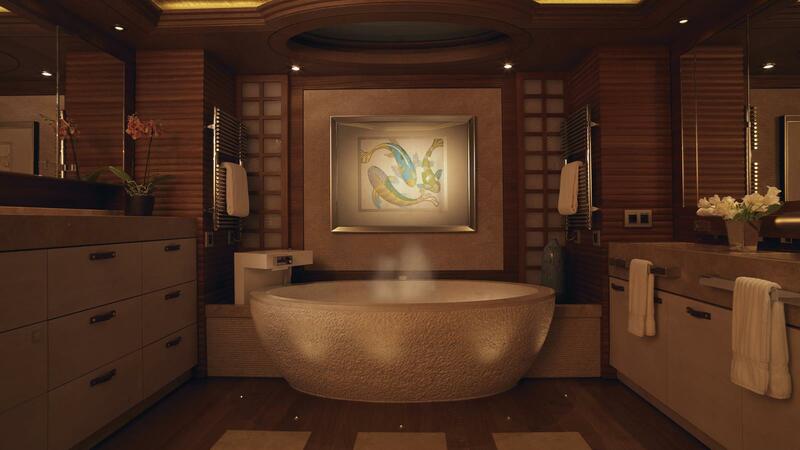 Some of the outstanding features onboard include a spa pool for eight, a 54- square-meter gymnasium and an entertainment lounge. 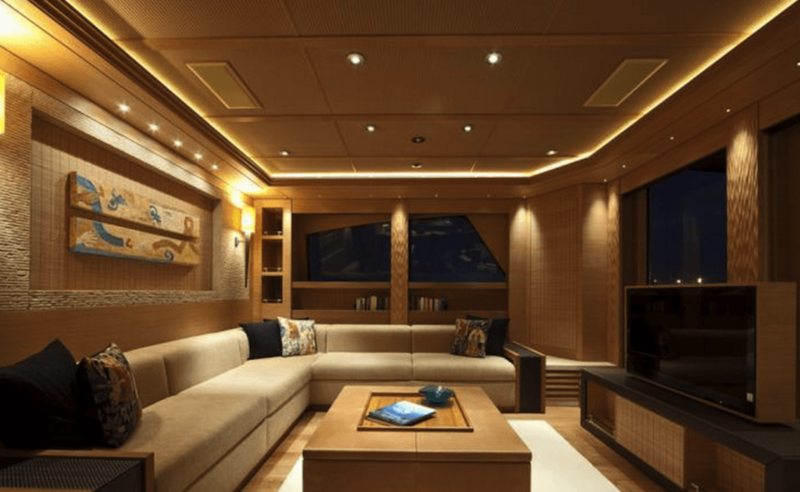 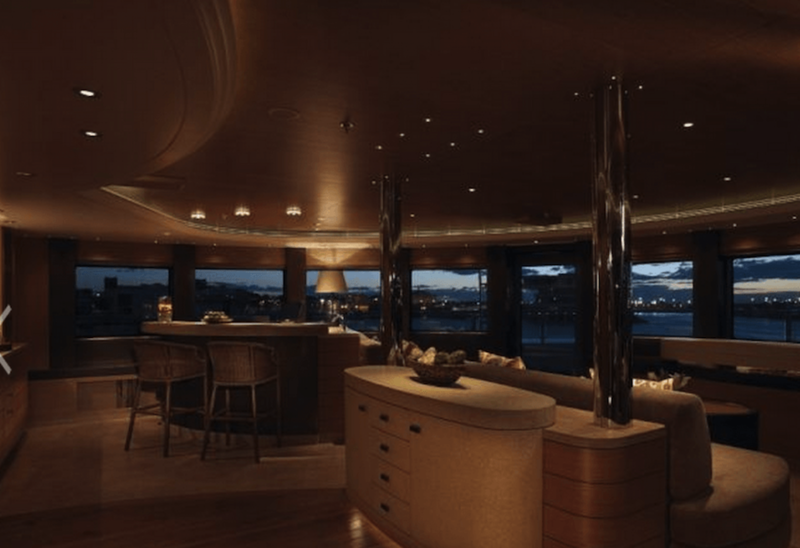 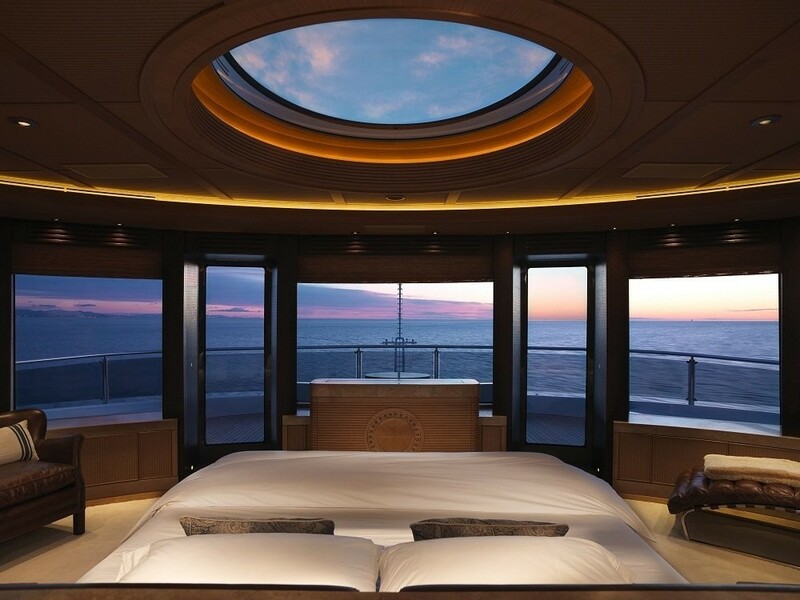 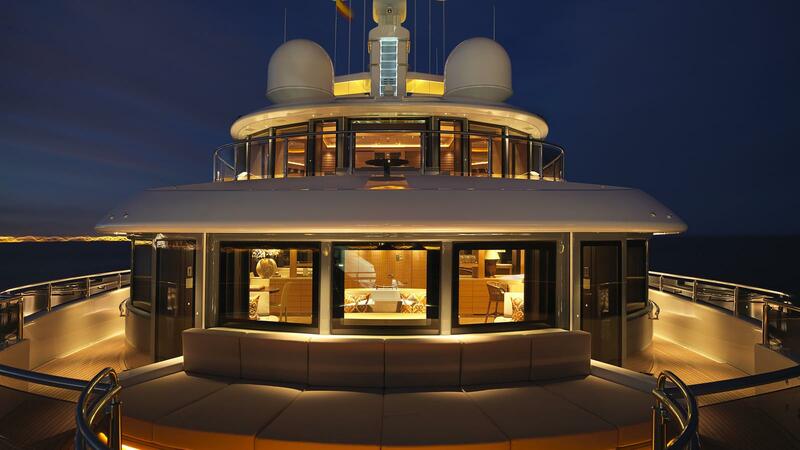 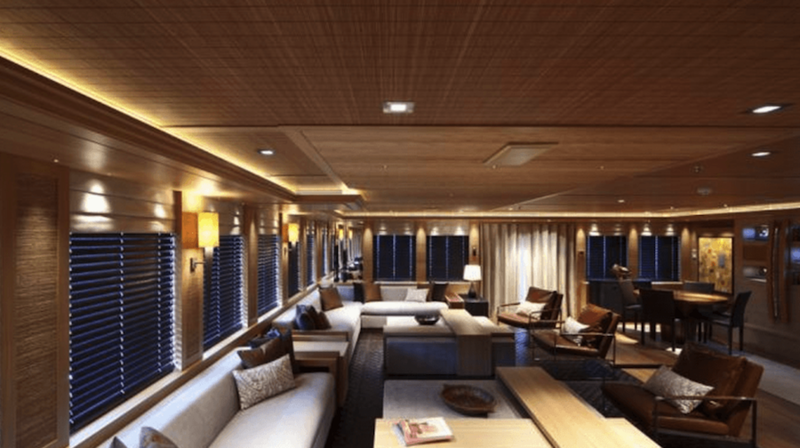 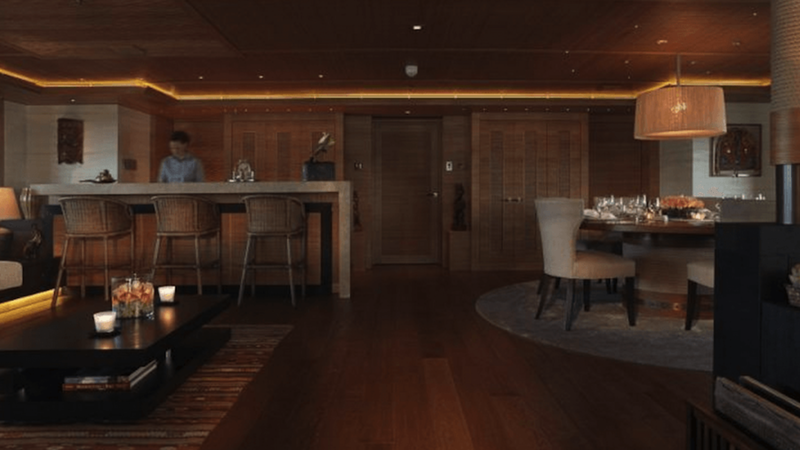 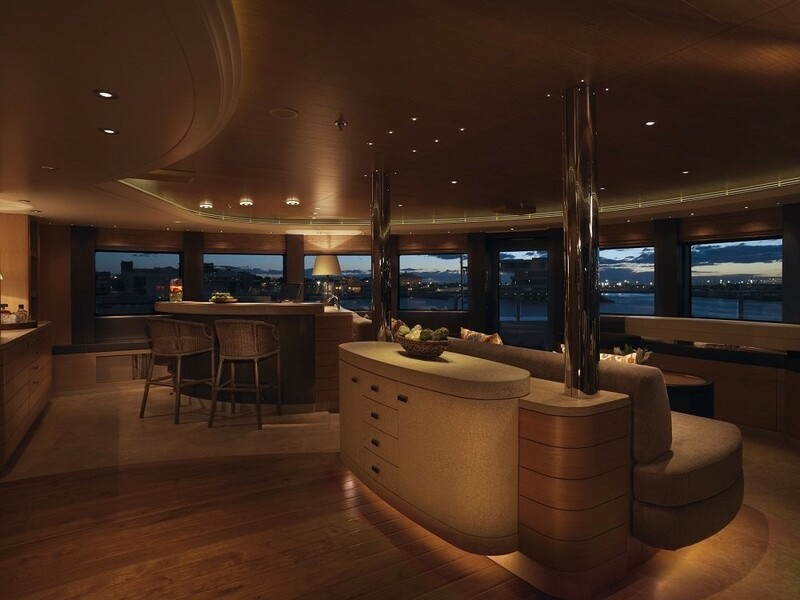 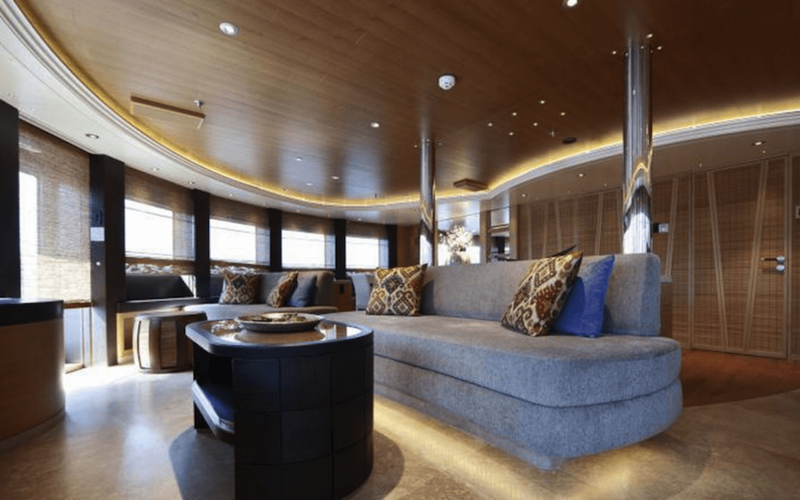 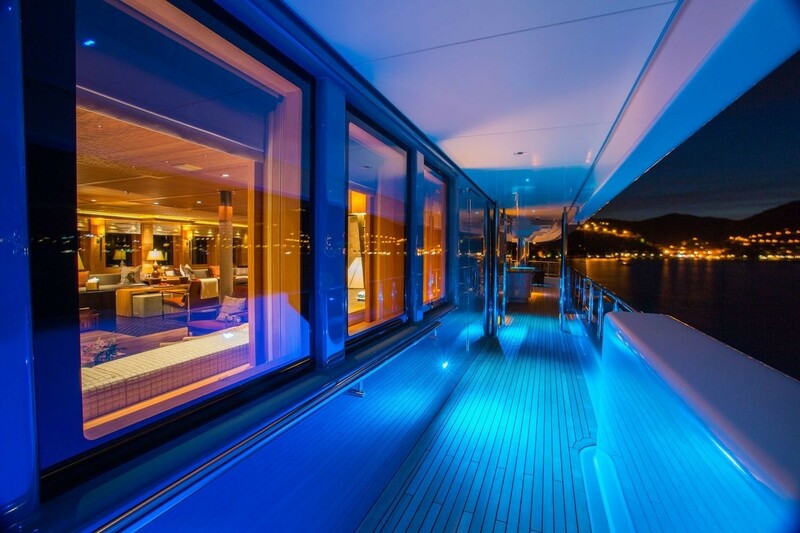 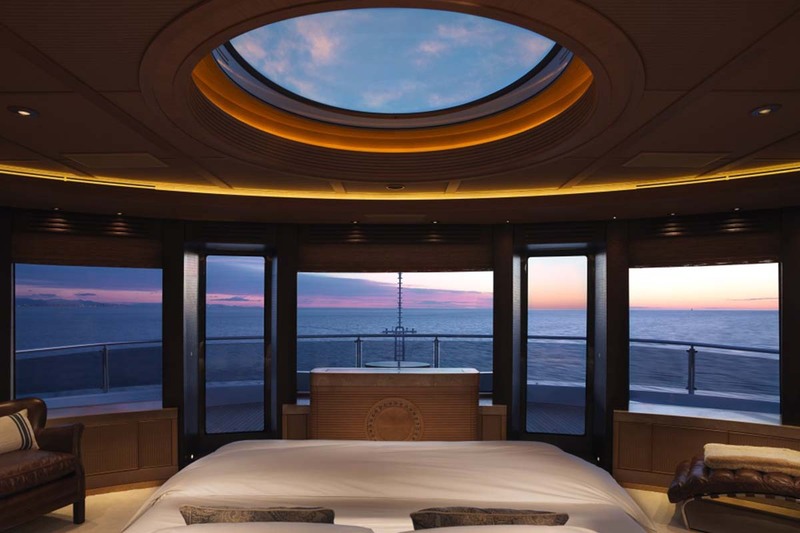 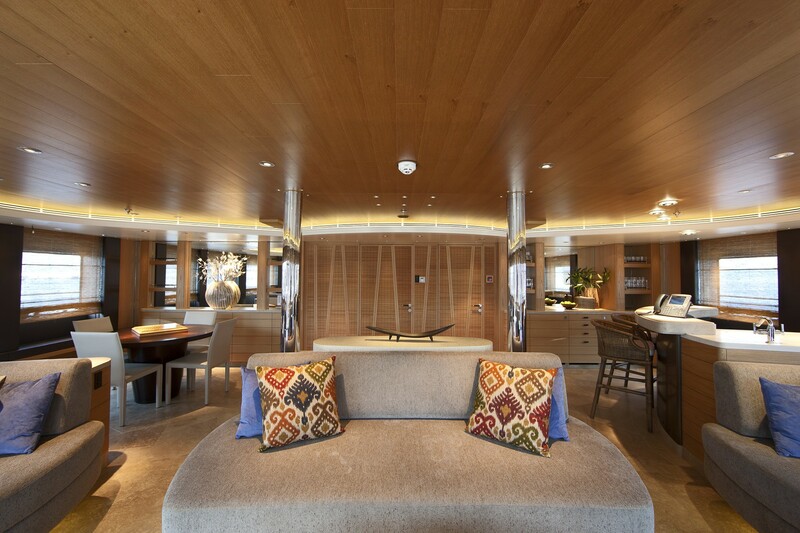 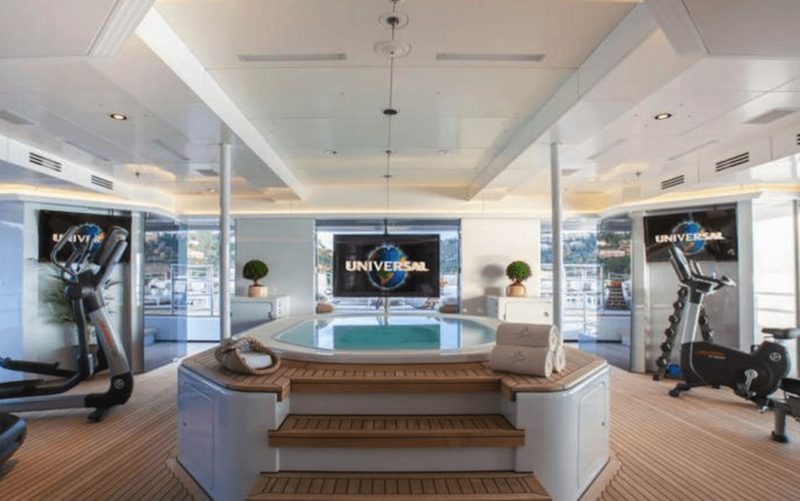 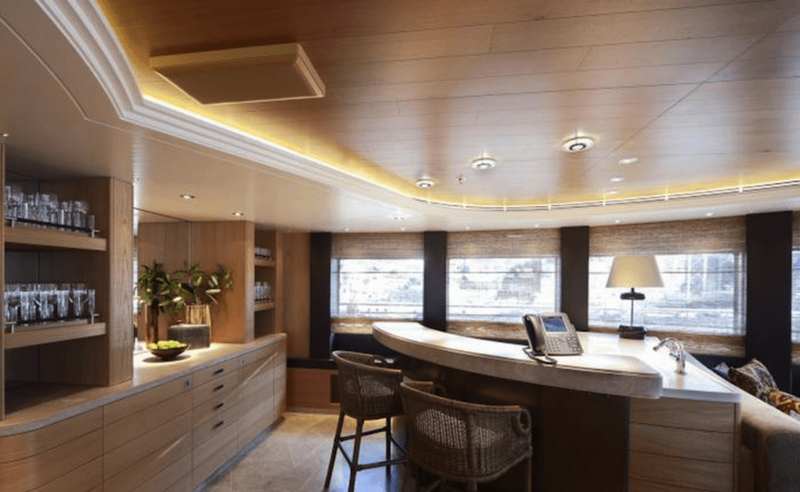 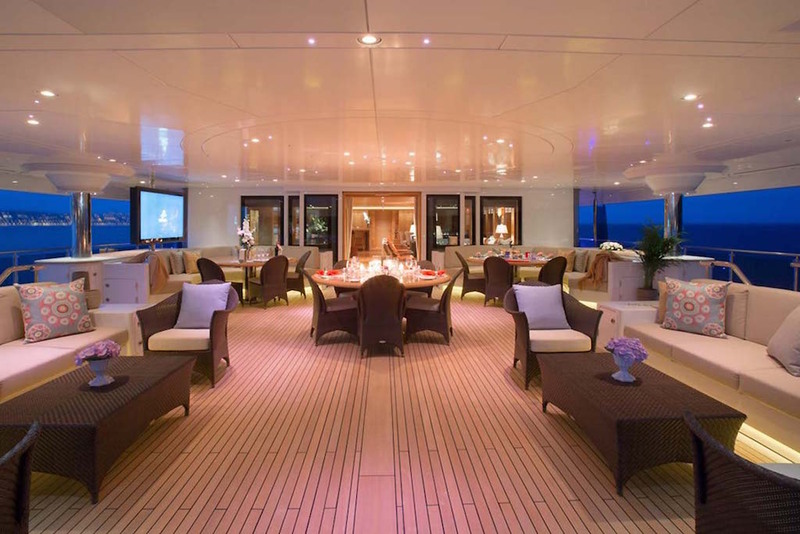 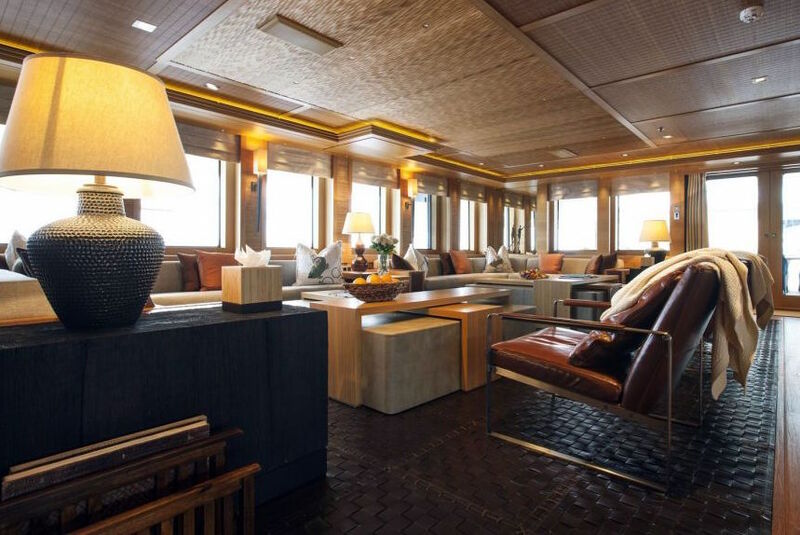 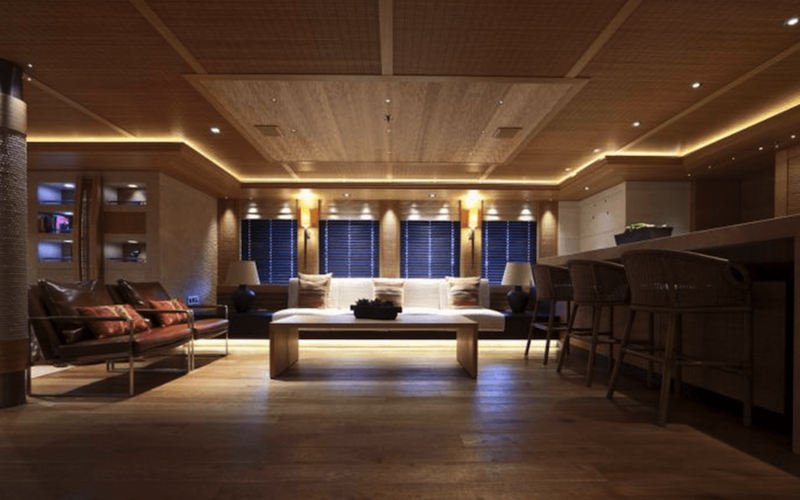 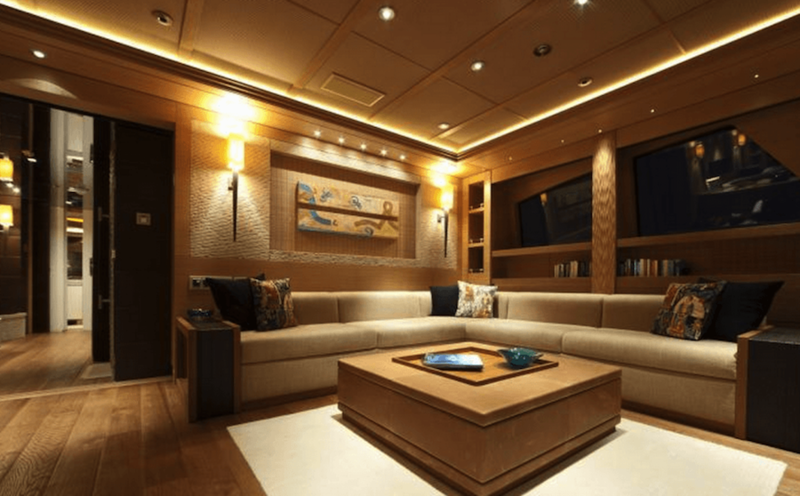 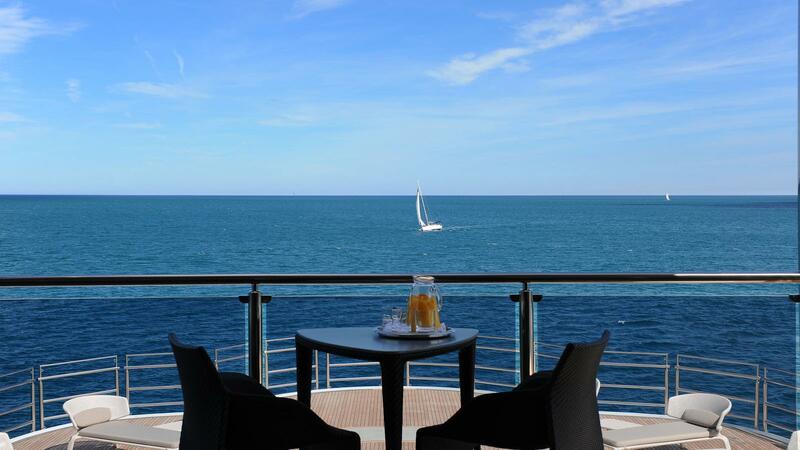 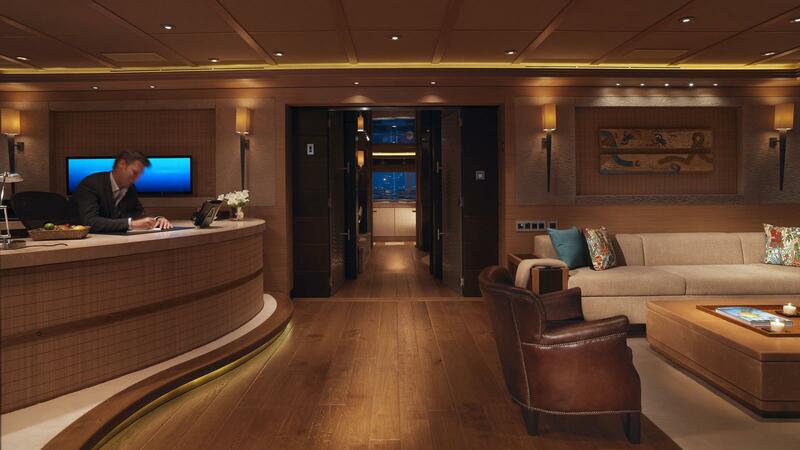 Also, charter guests will appreciate the stunning observation lounge from which they can enjoy picturesque views of the best yachting locations in the world. 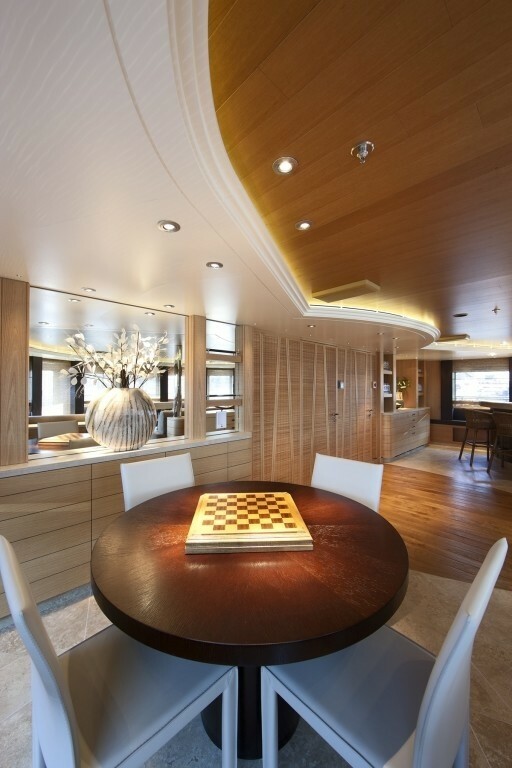 Various lounging and dining possibilities can be found on board this spectacular vessel, including a large al fresco dining area on the aft deck with a buffet and casual seating, with an additional bar. 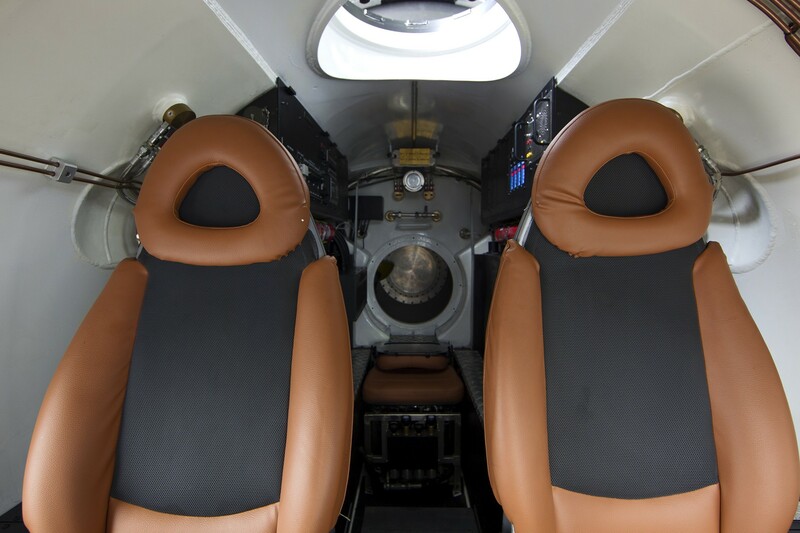 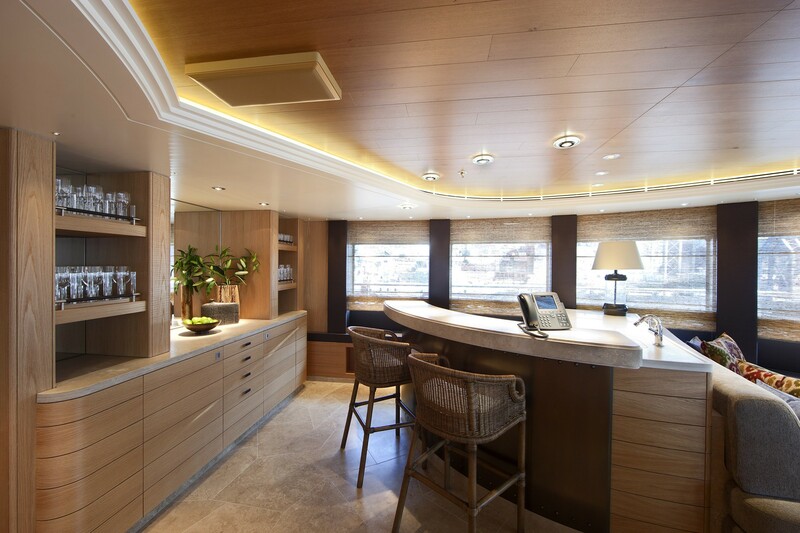 The helideck is another great feature, with fore and aft sun decks. 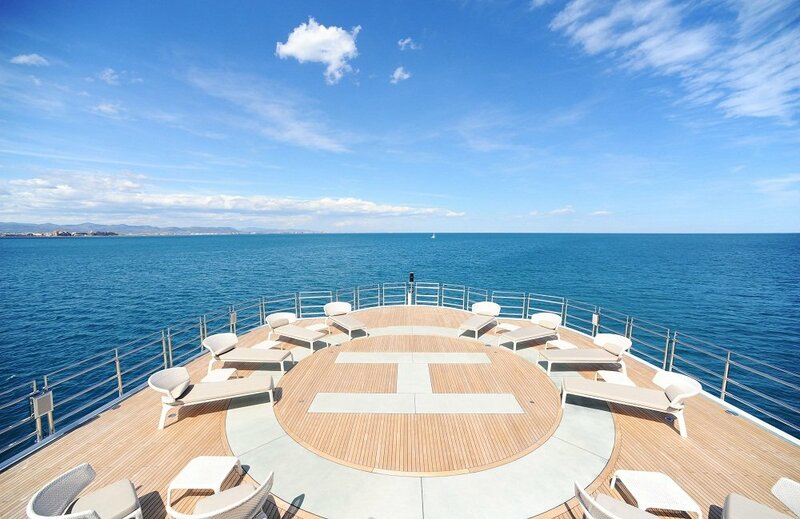 The aft can be converted into the yacht’s helicopter pad, from a fabulous large area with comfortable seating and sun loungers. 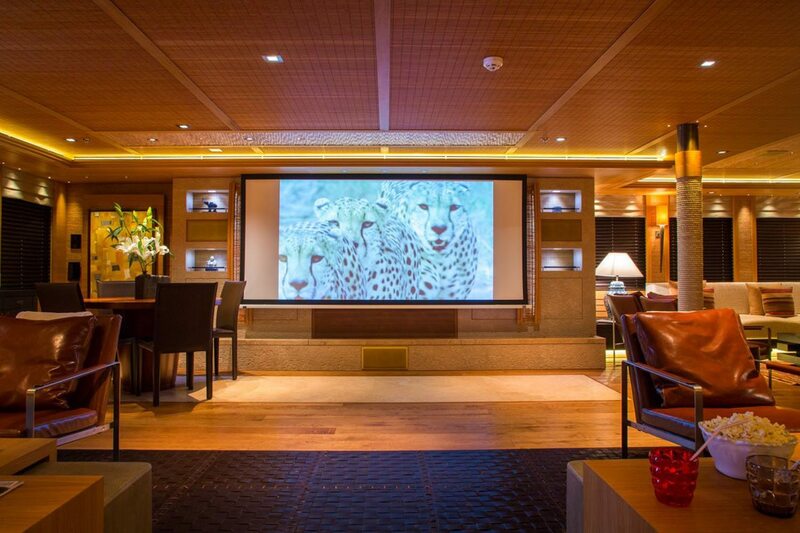 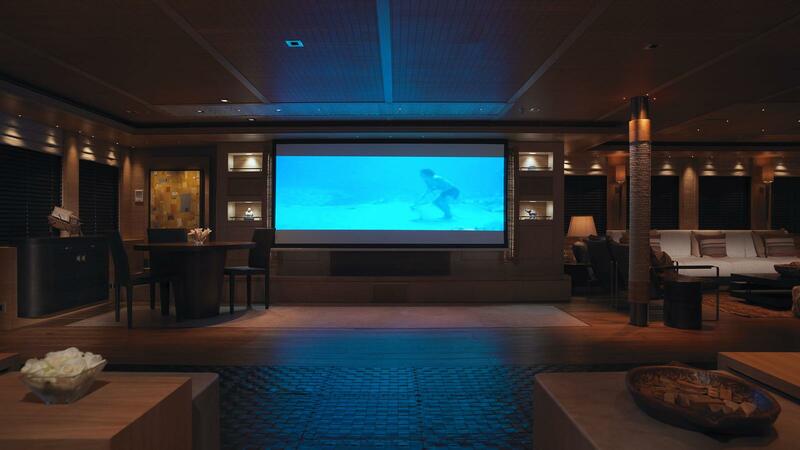 The large salon transforms into a cinema with a 120-inch screen, making it possible to watch favorite movies programs on the state-of-the-art entertainment system. 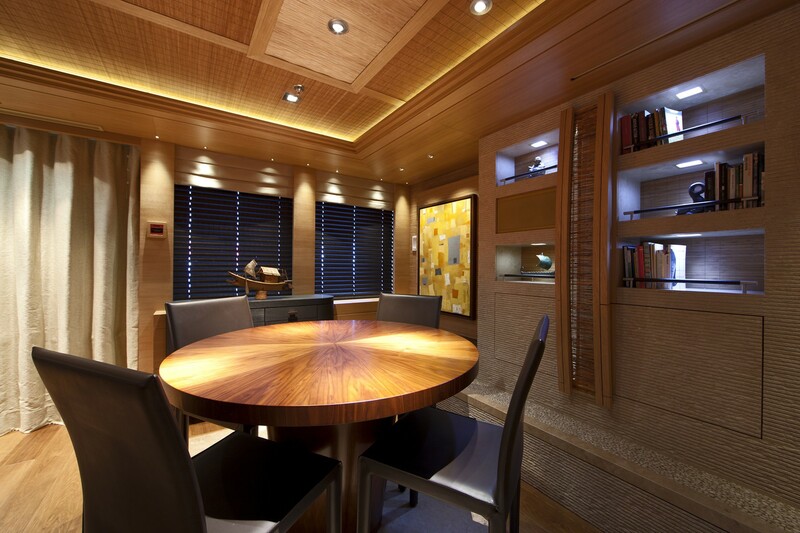 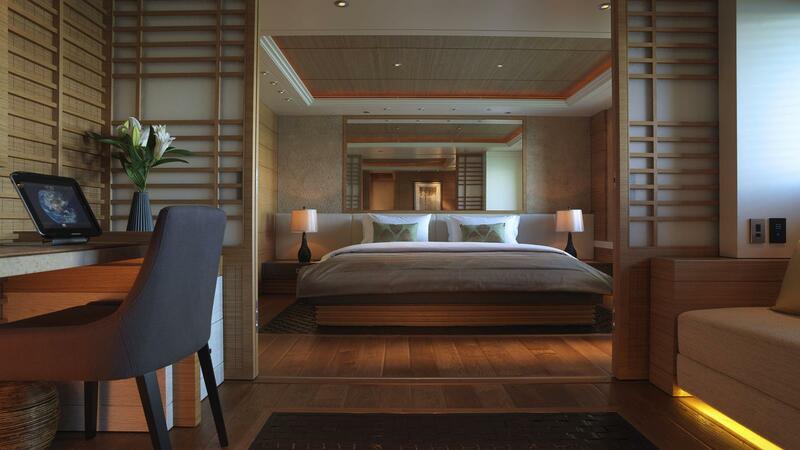 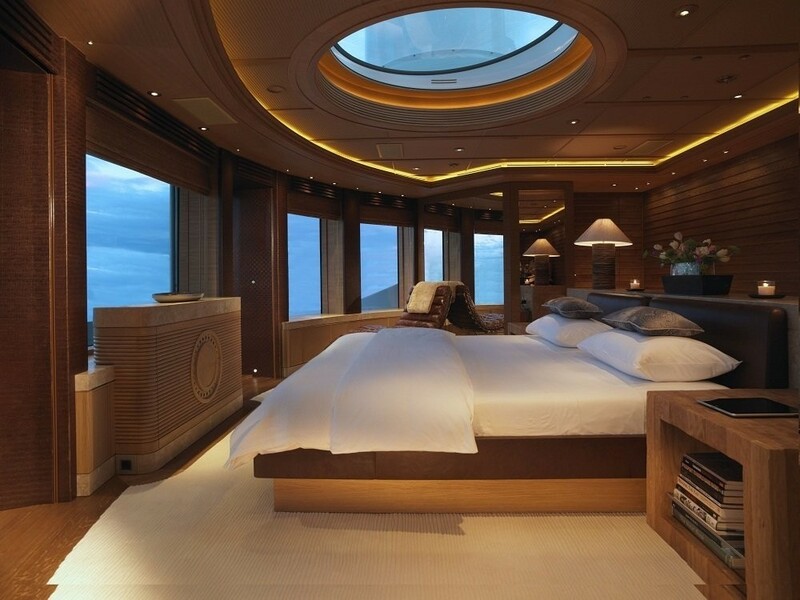 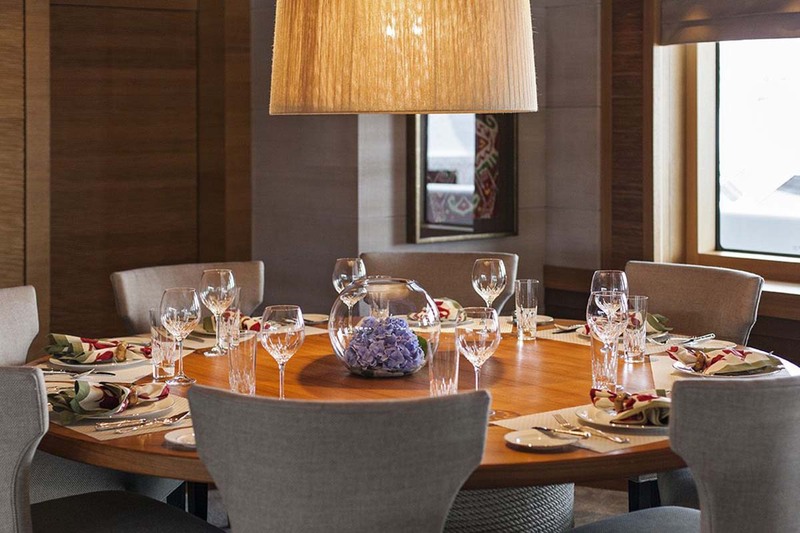 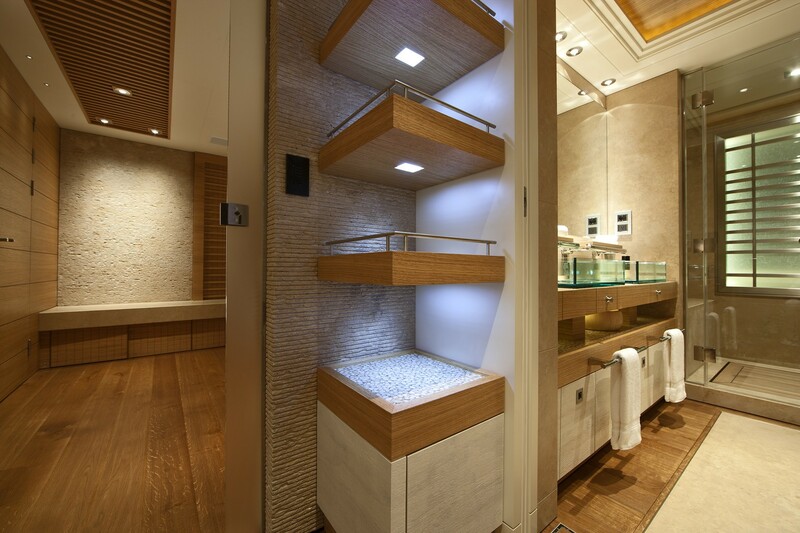 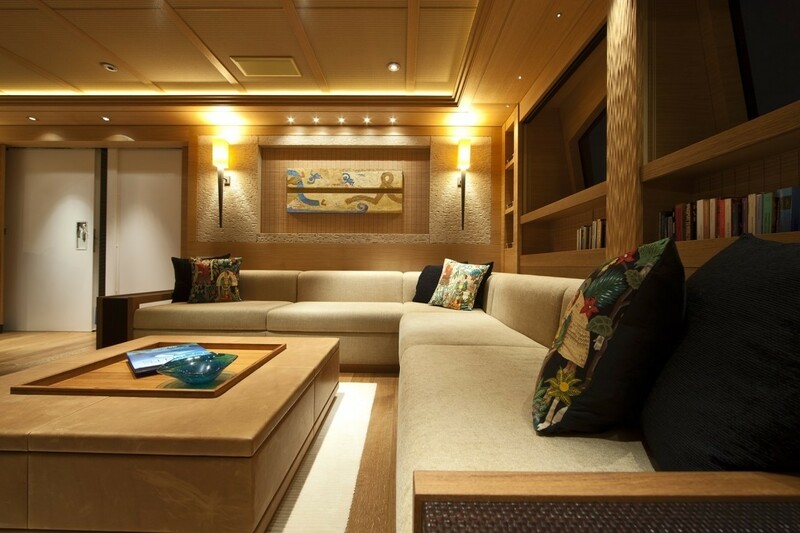 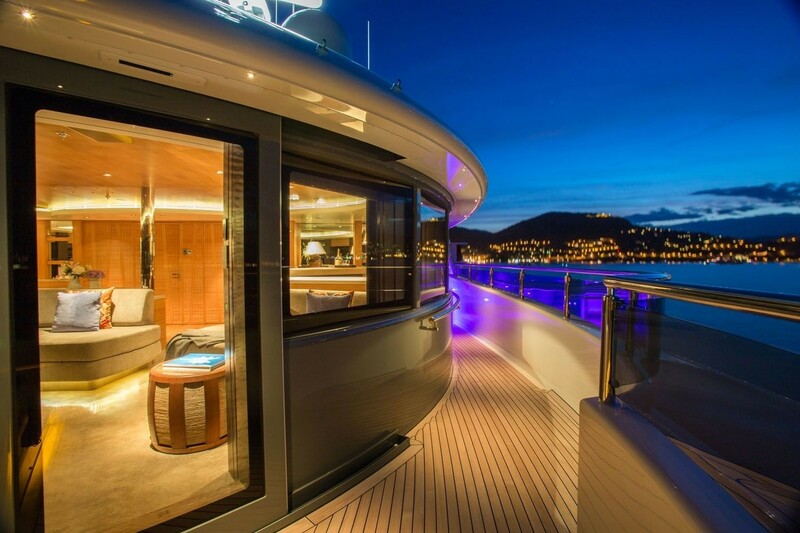 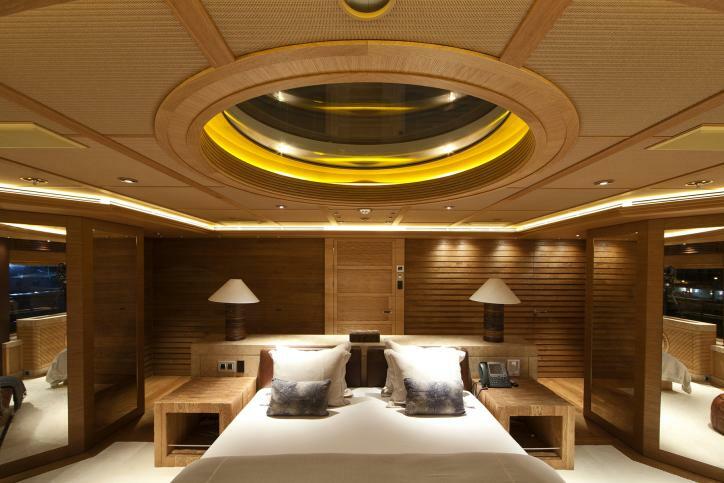 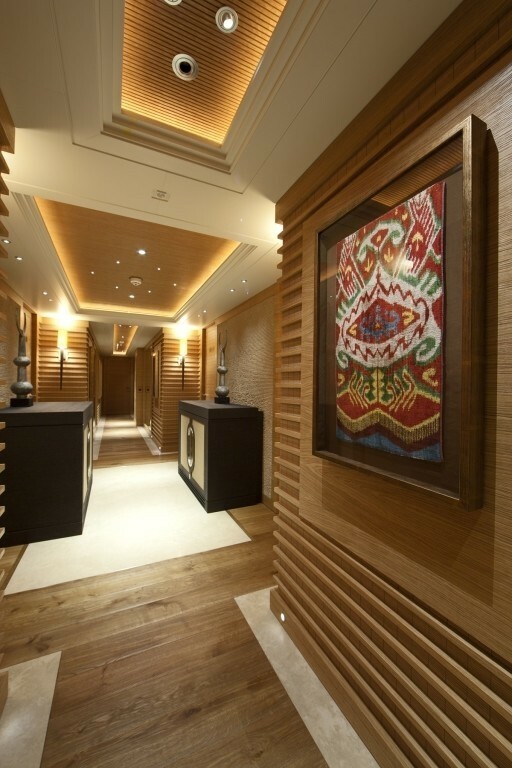 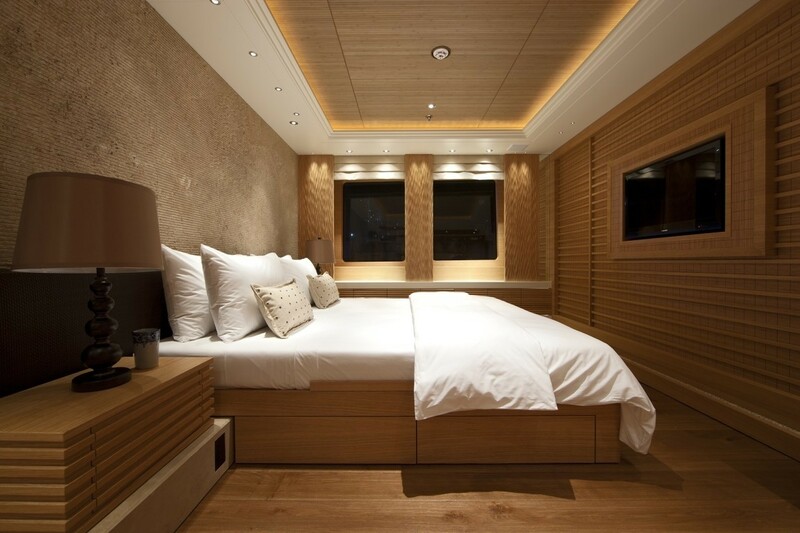 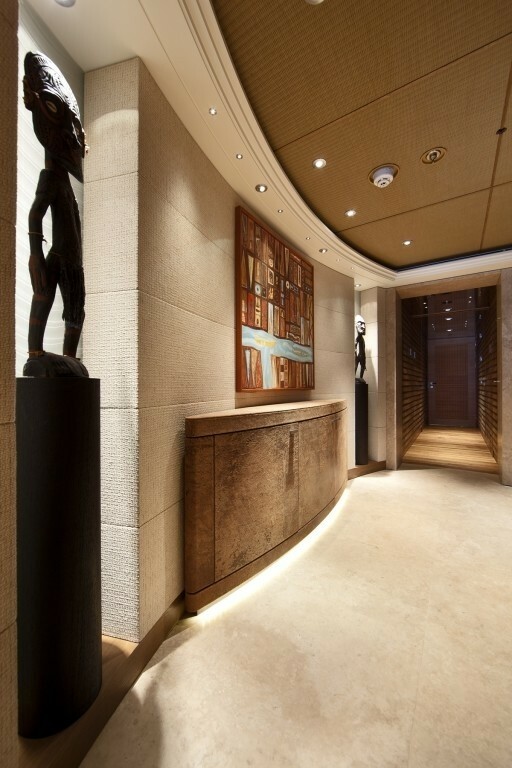 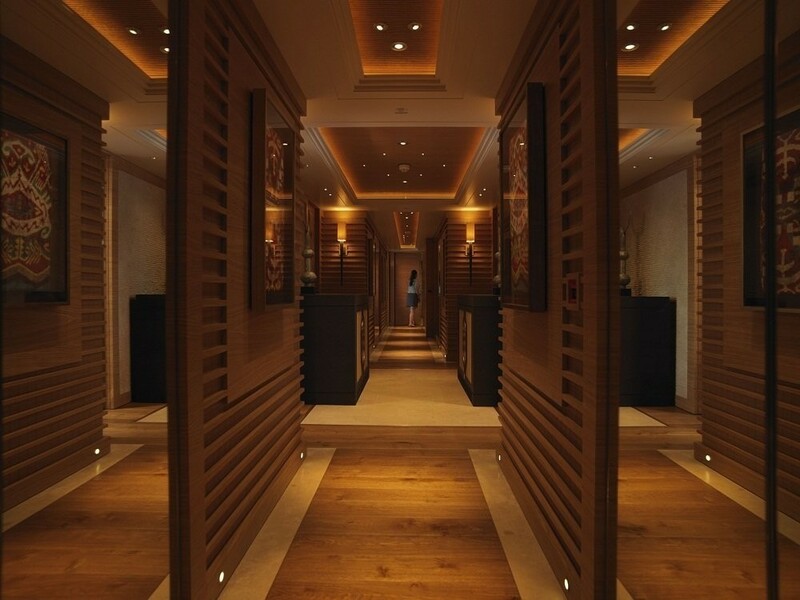 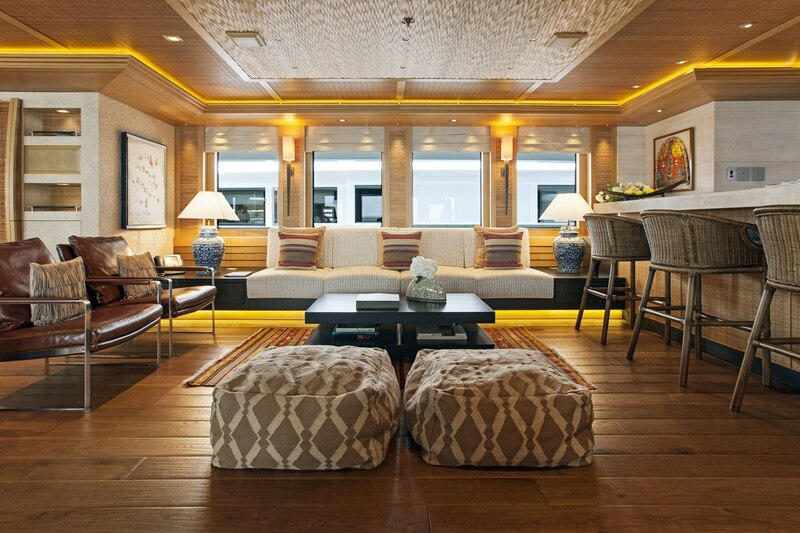 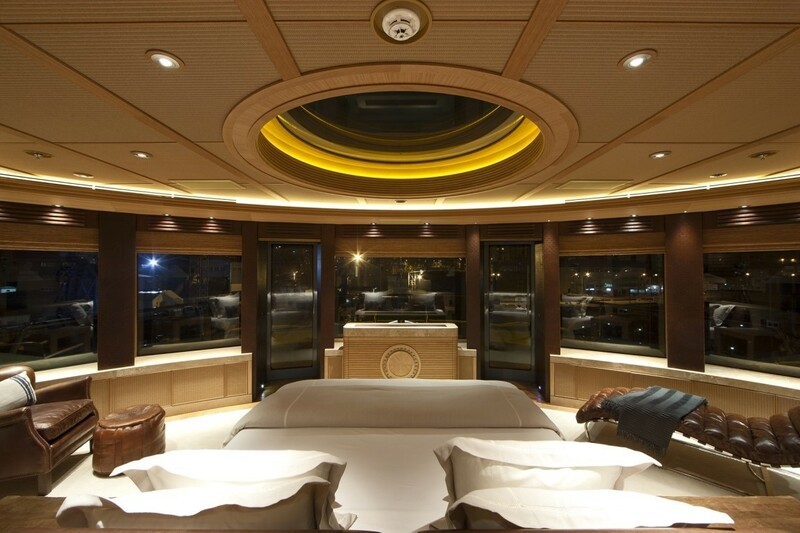 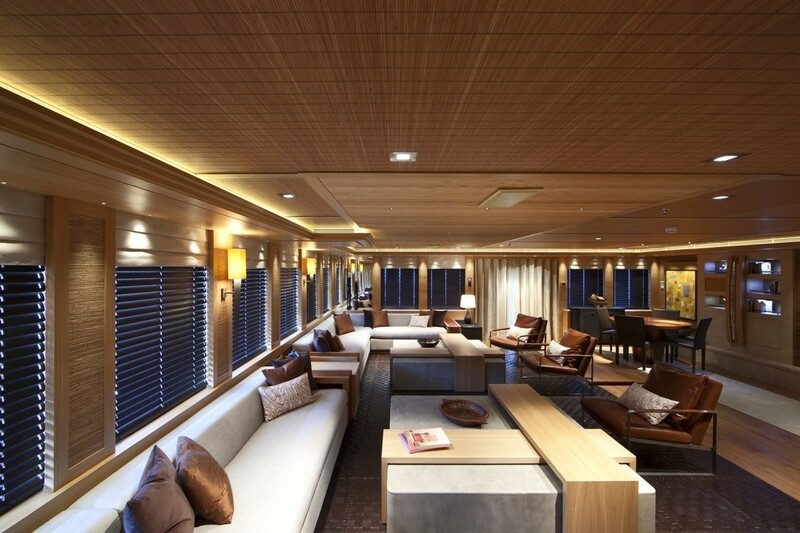 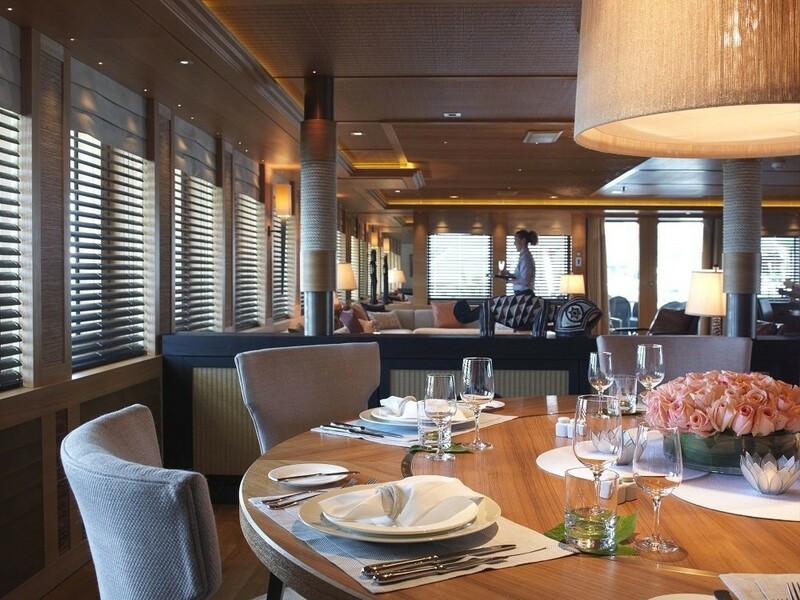 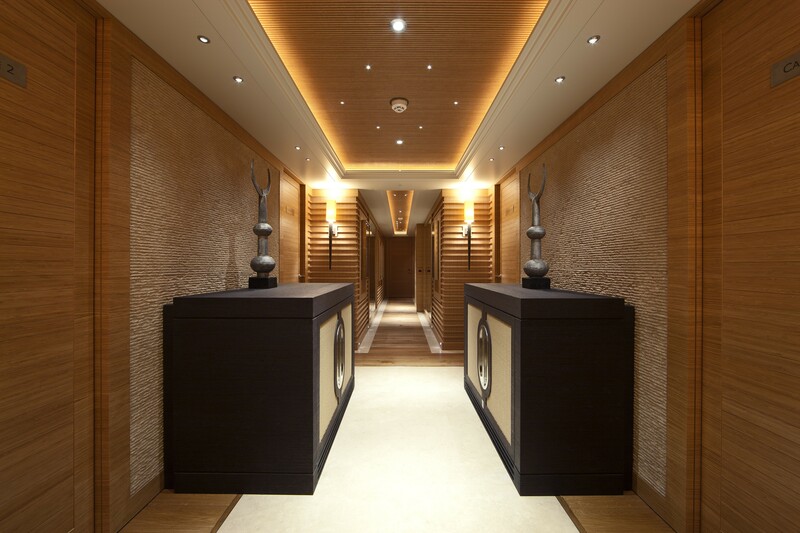 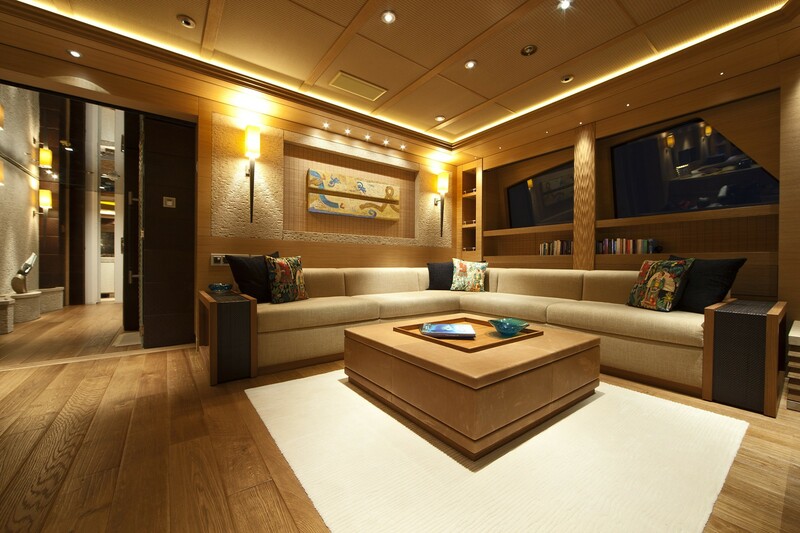 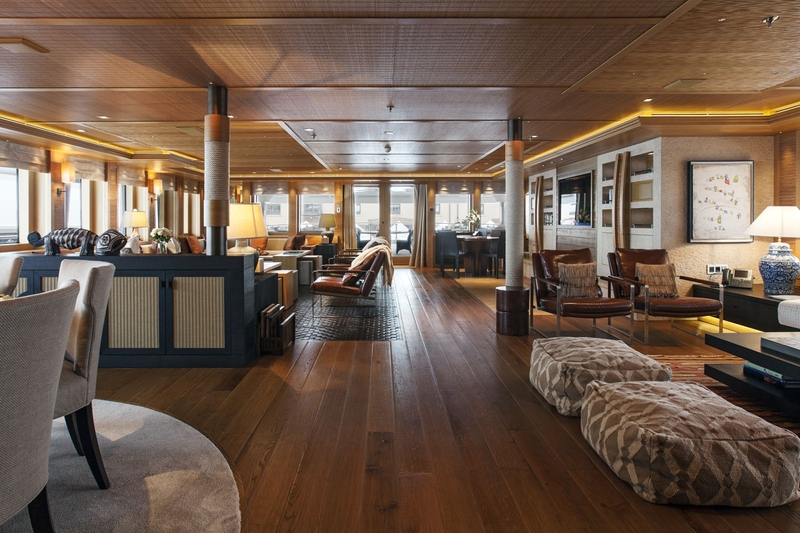 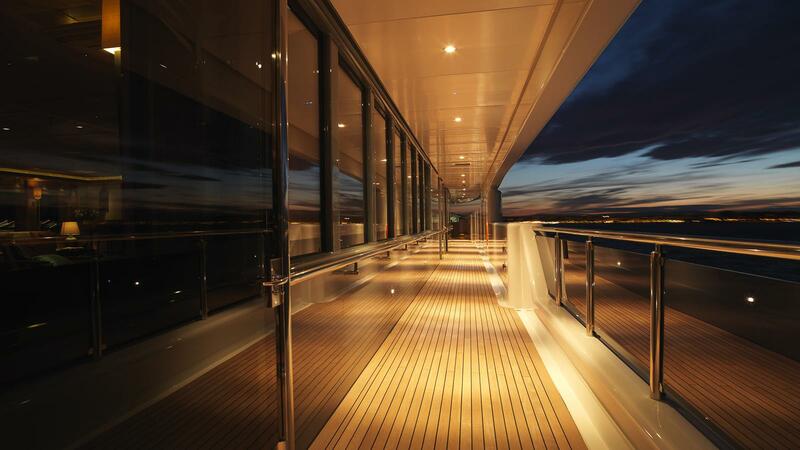 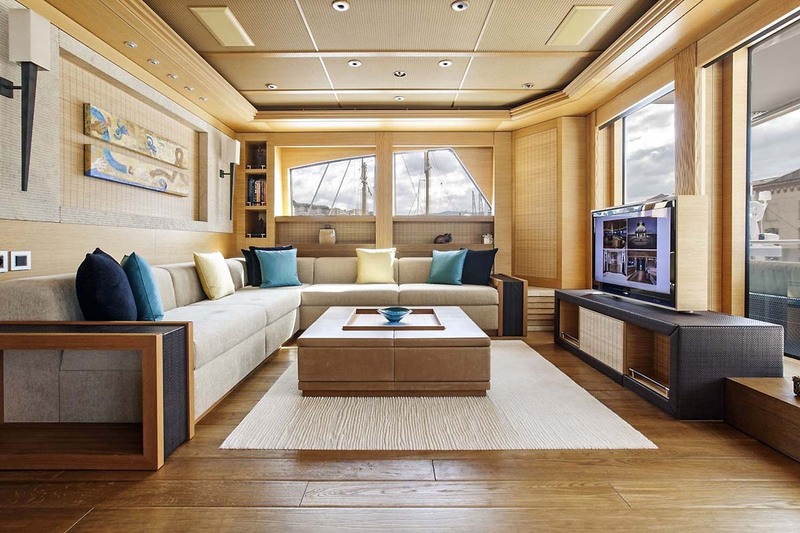 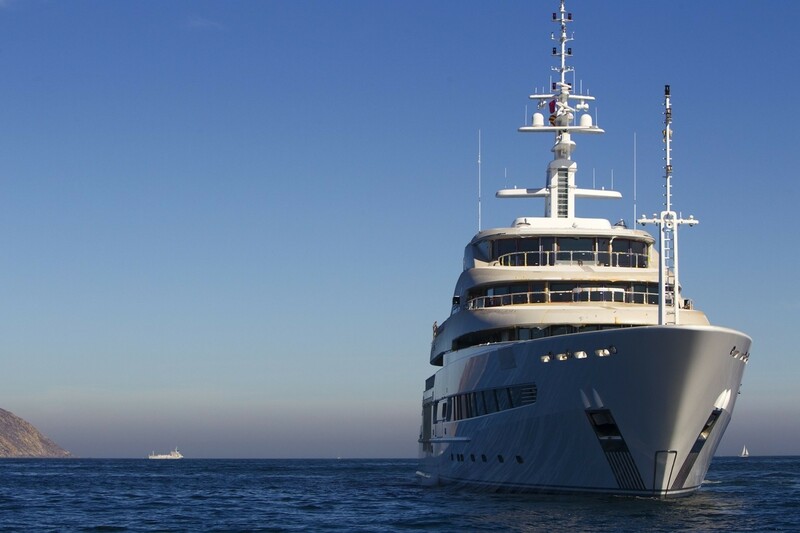 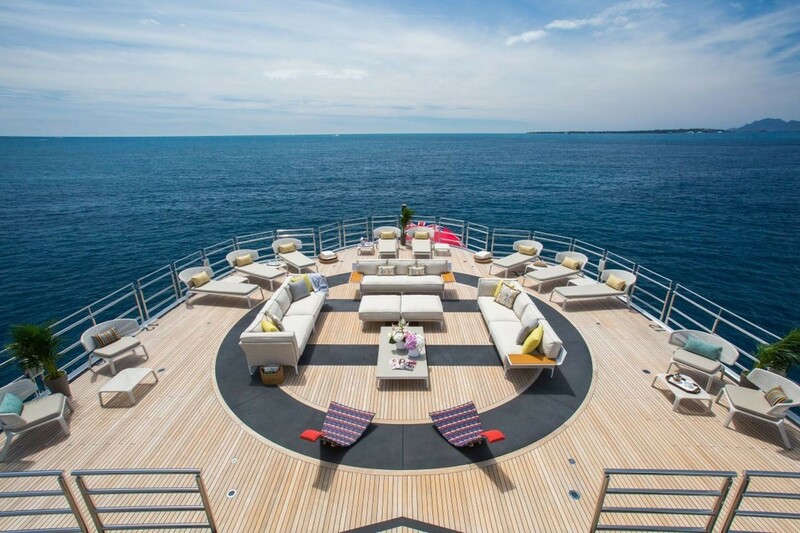 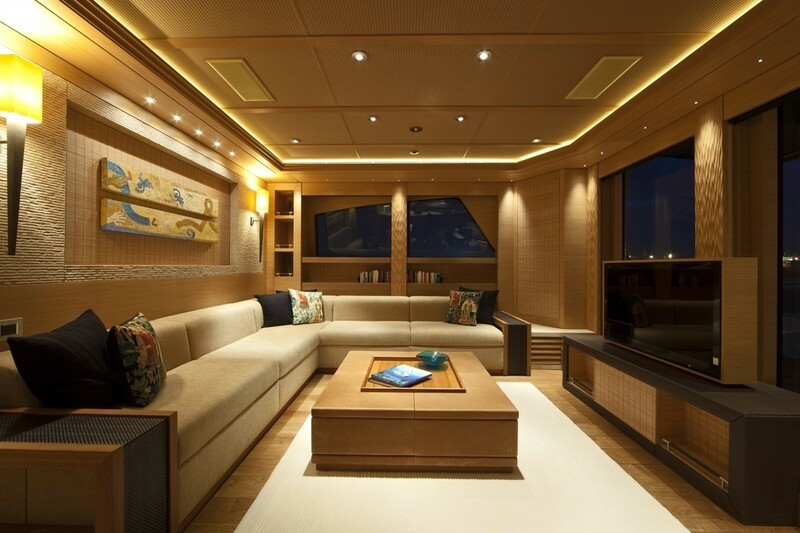 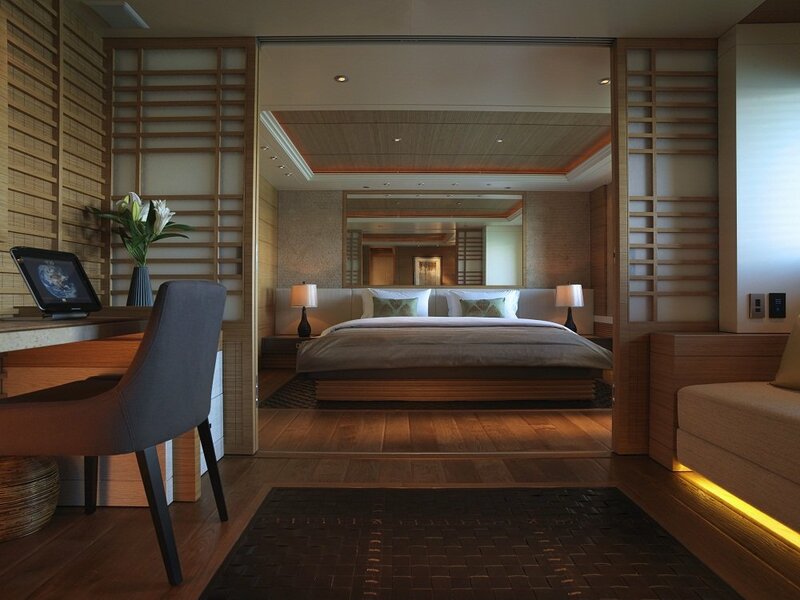 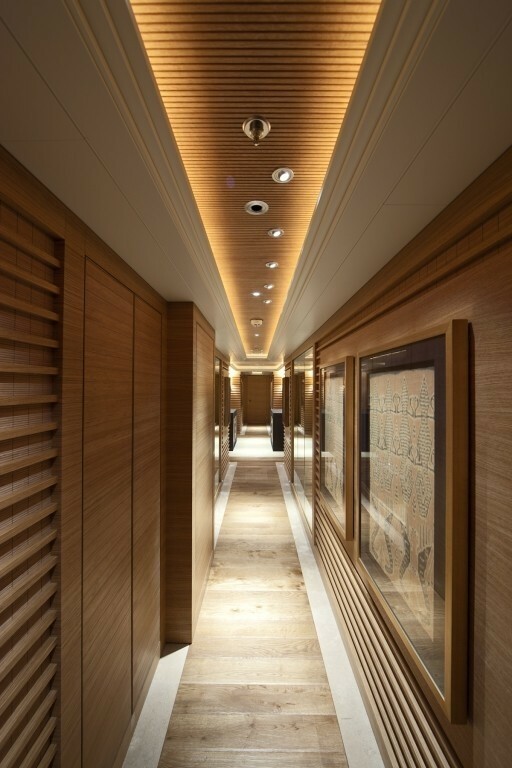 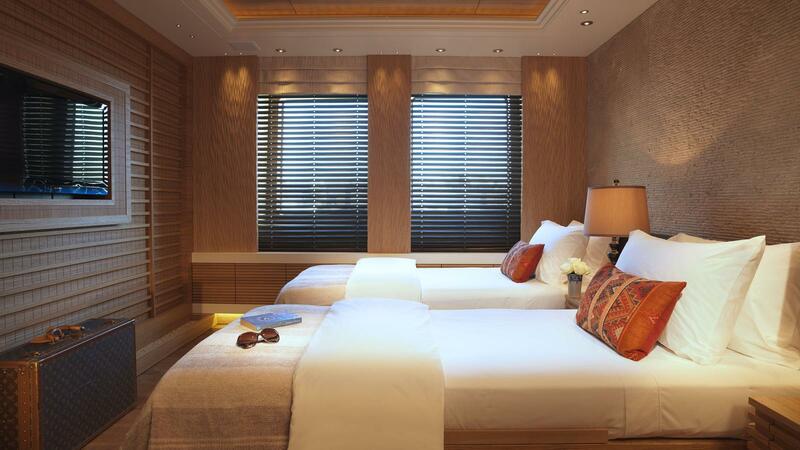 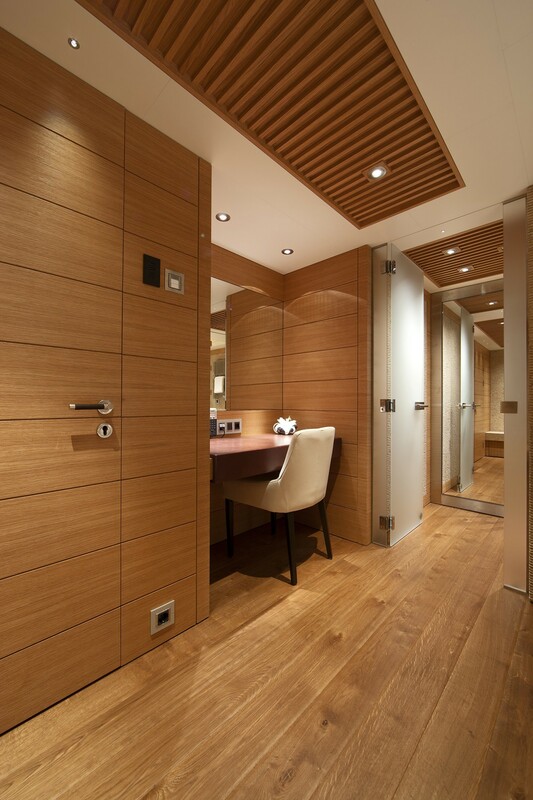 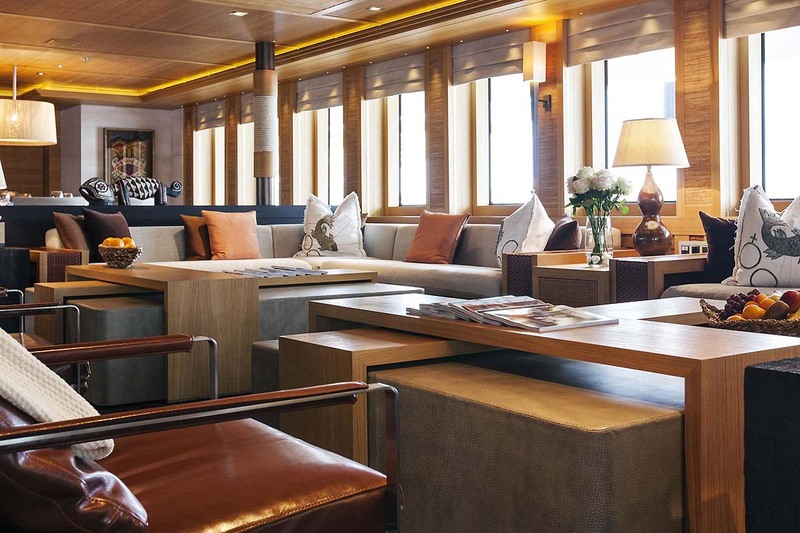 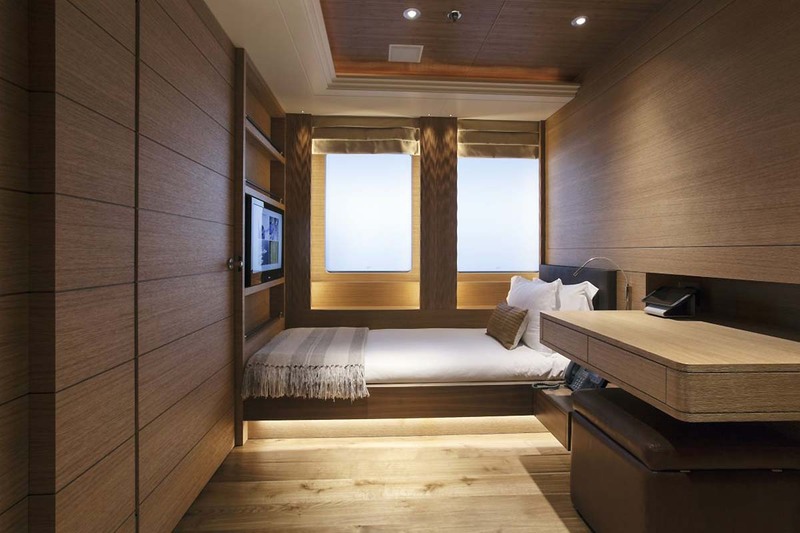 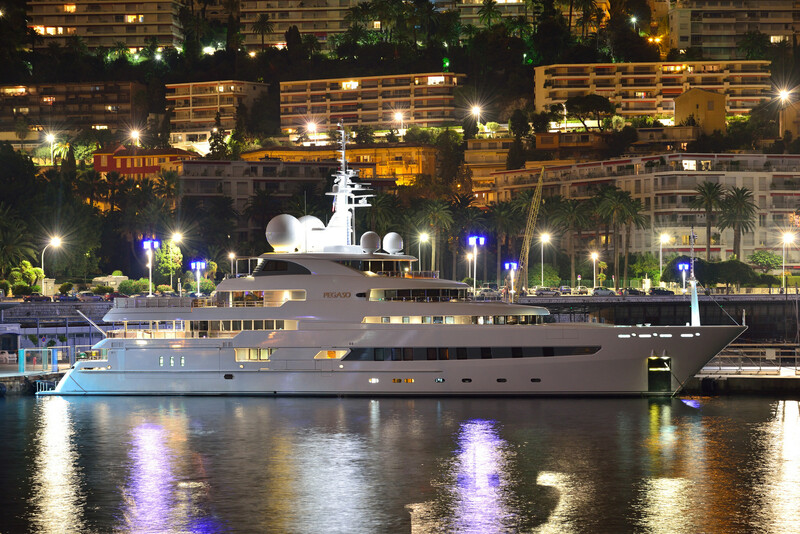 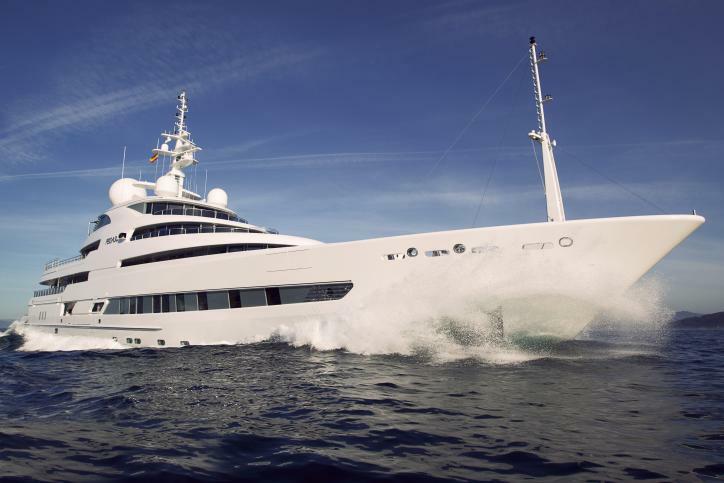 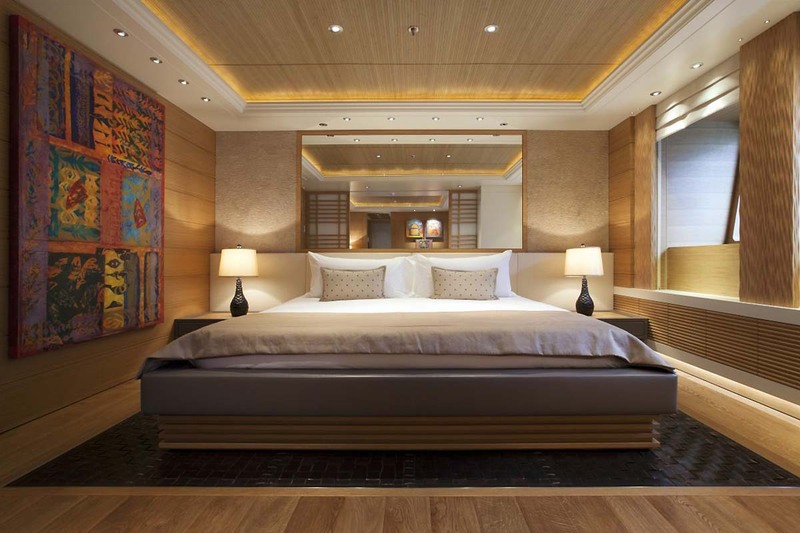 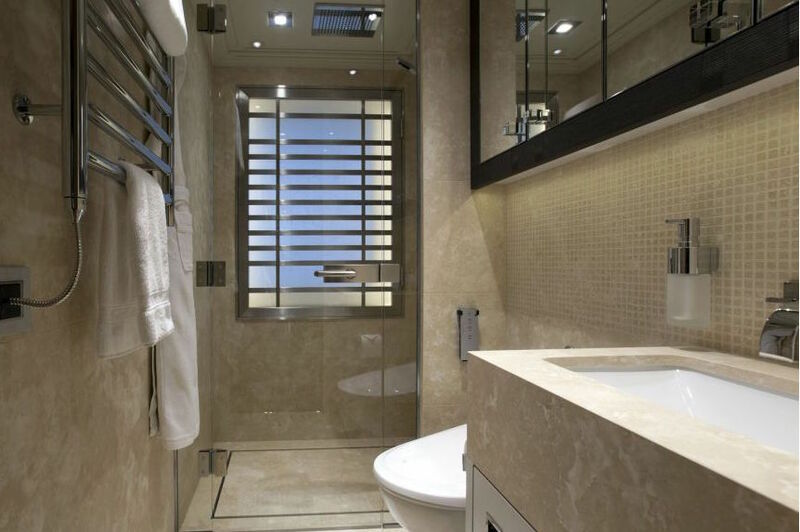 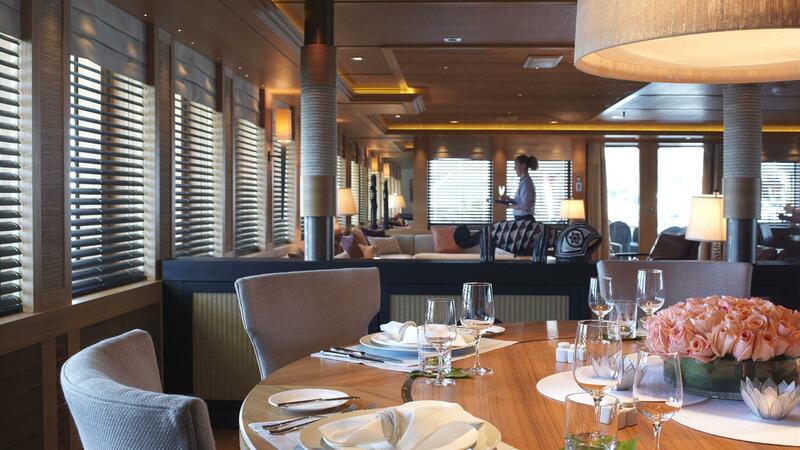 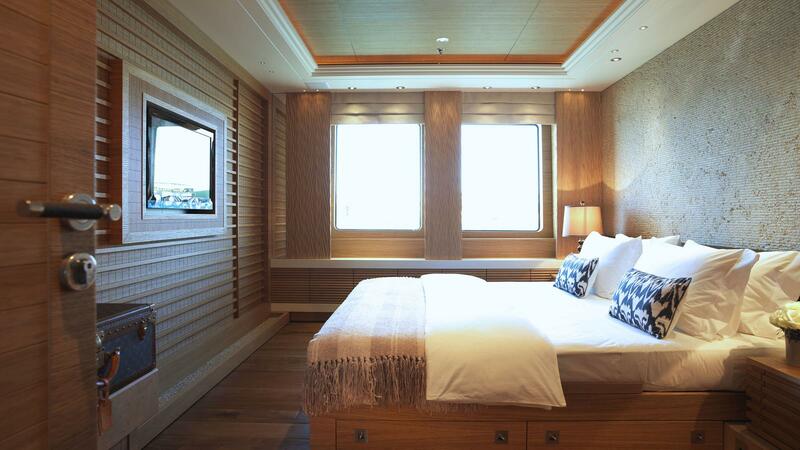 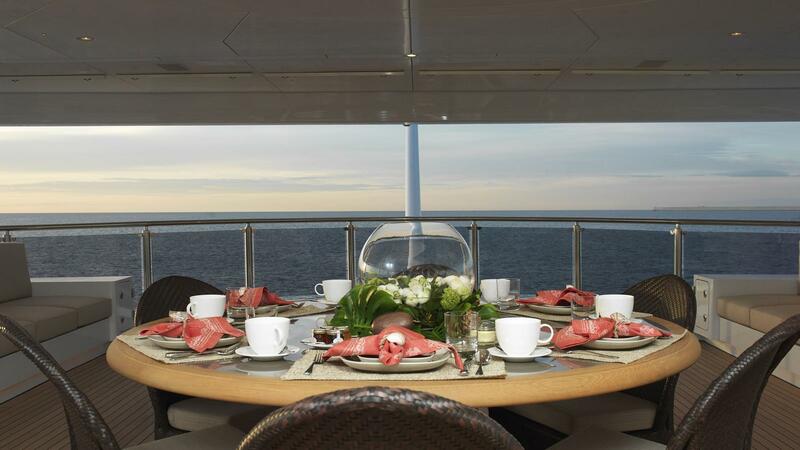 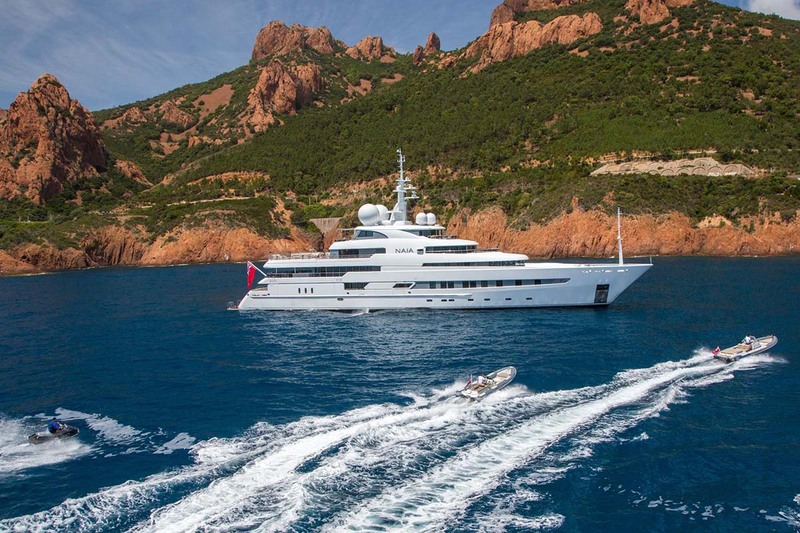 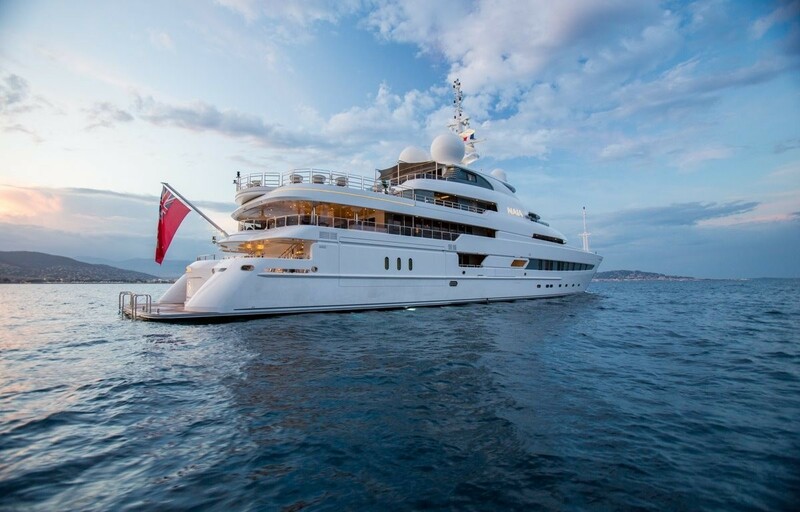 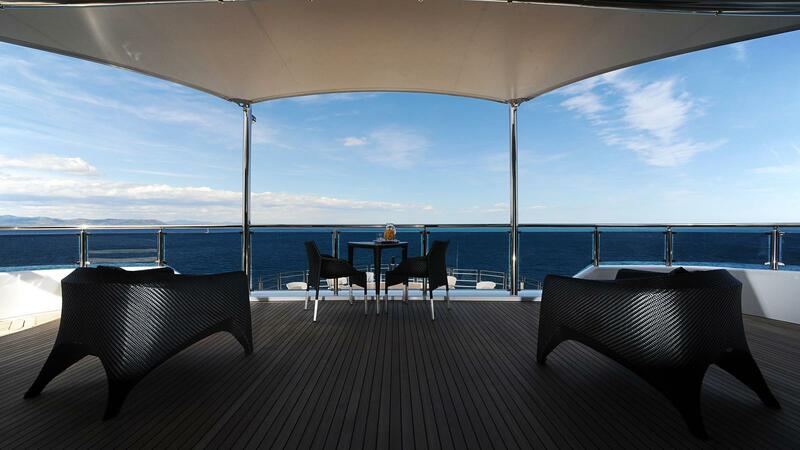 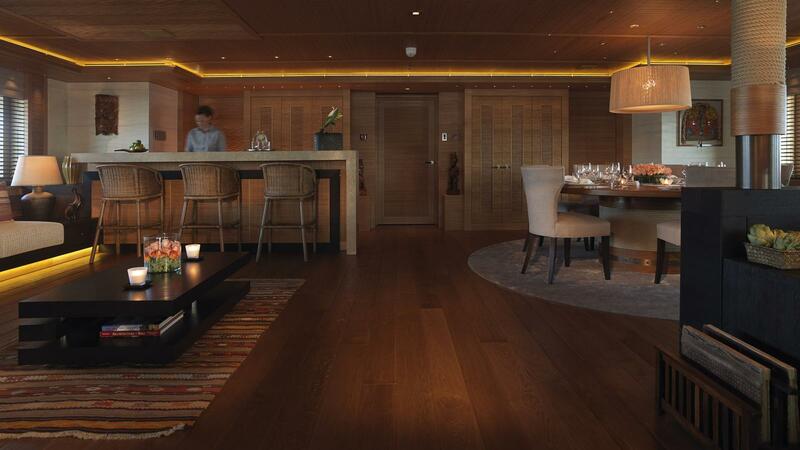 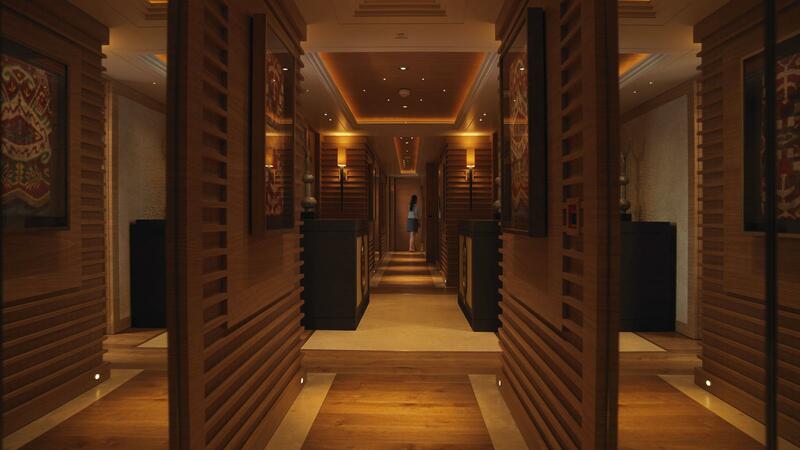 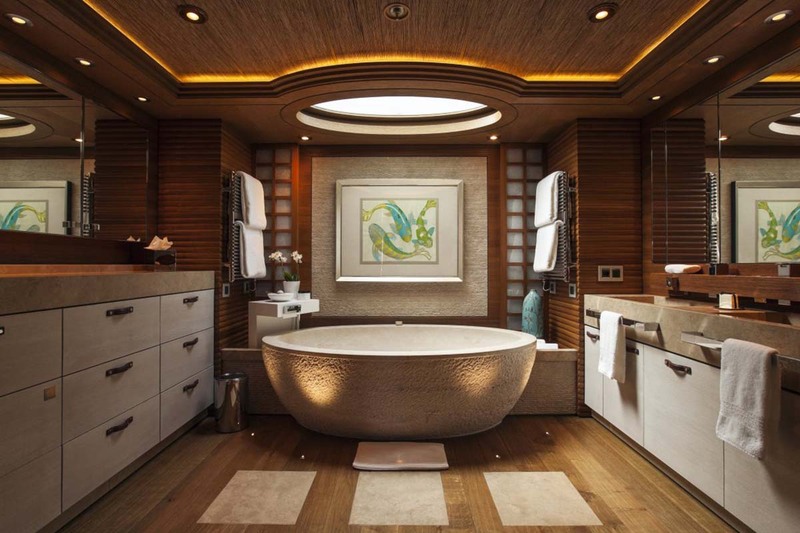 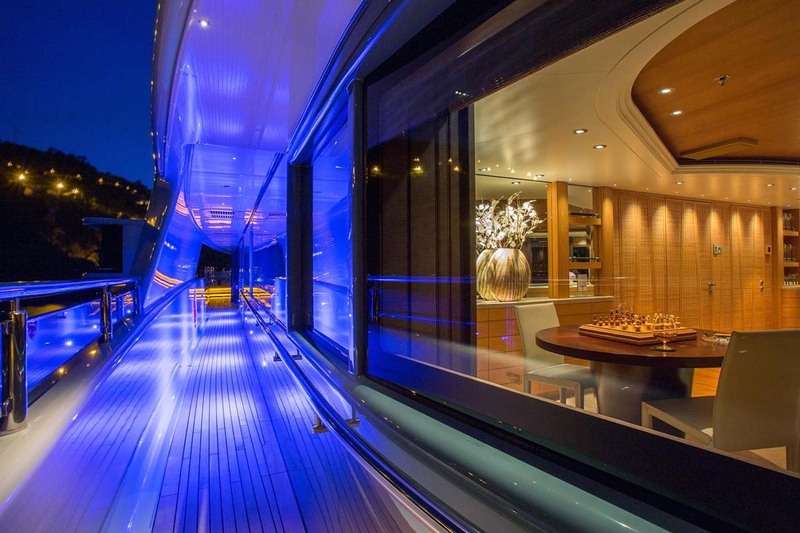 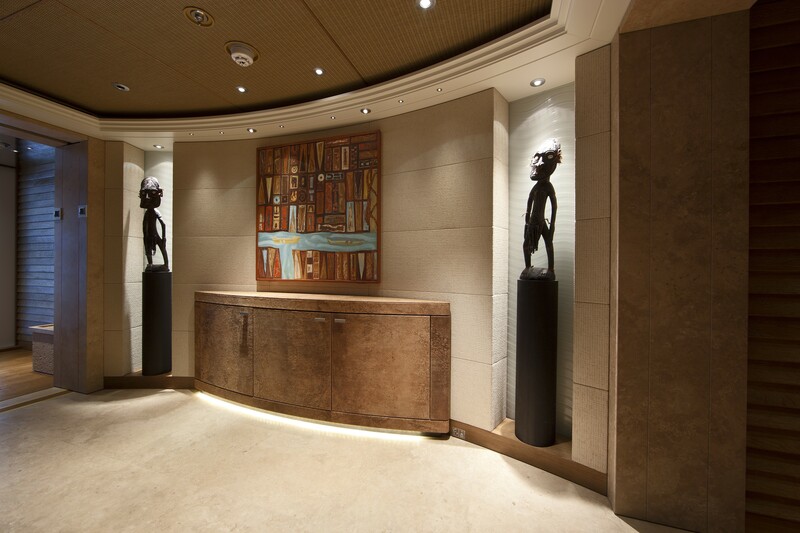 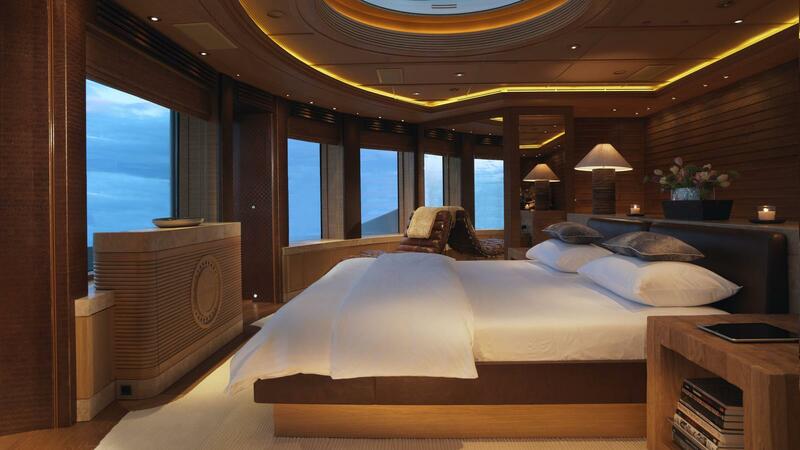 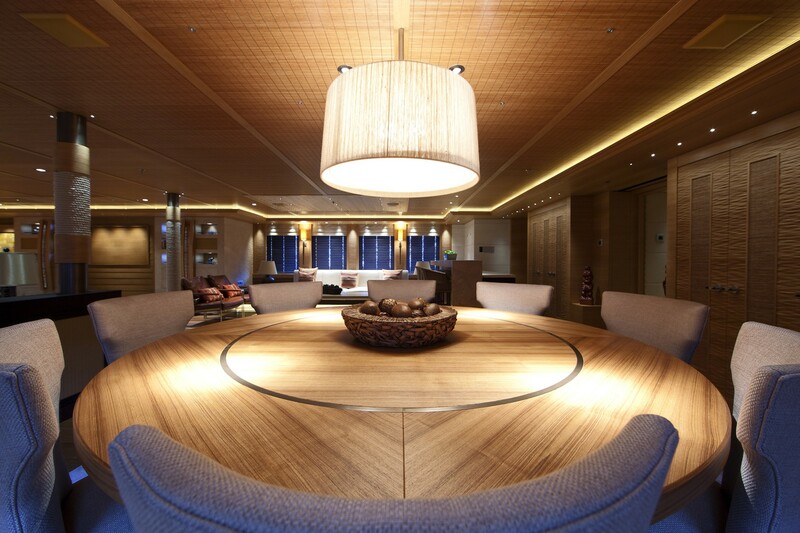 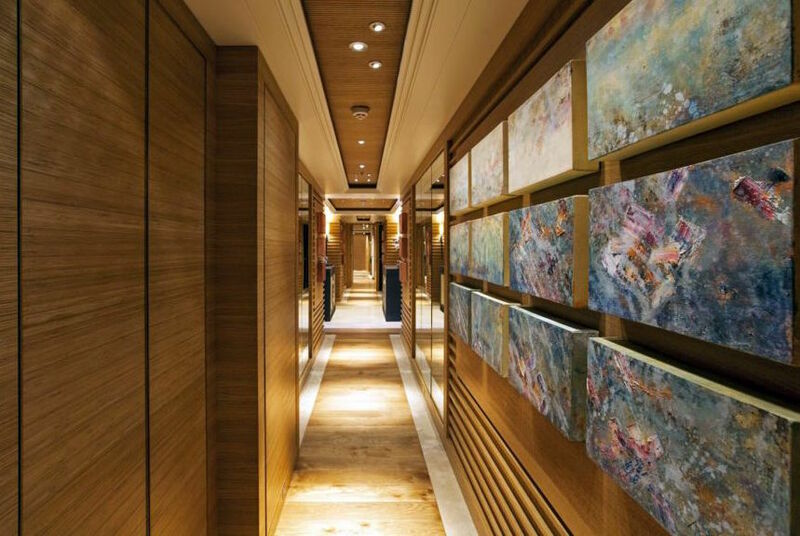 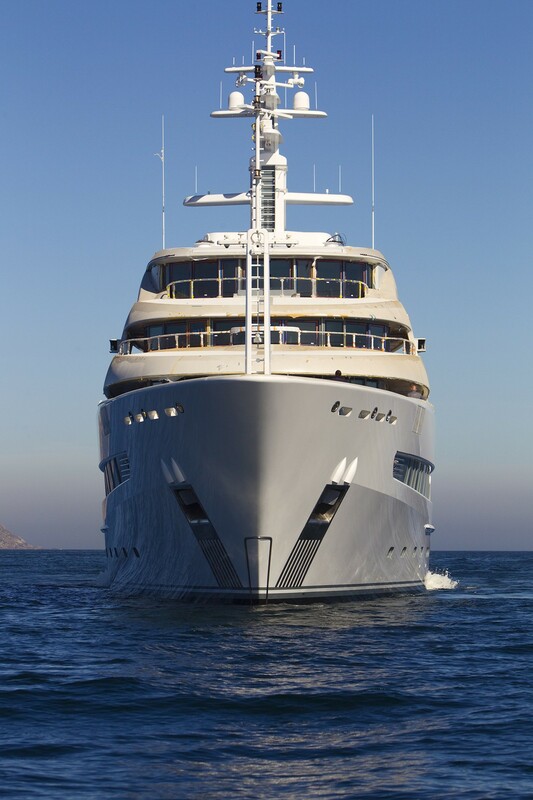 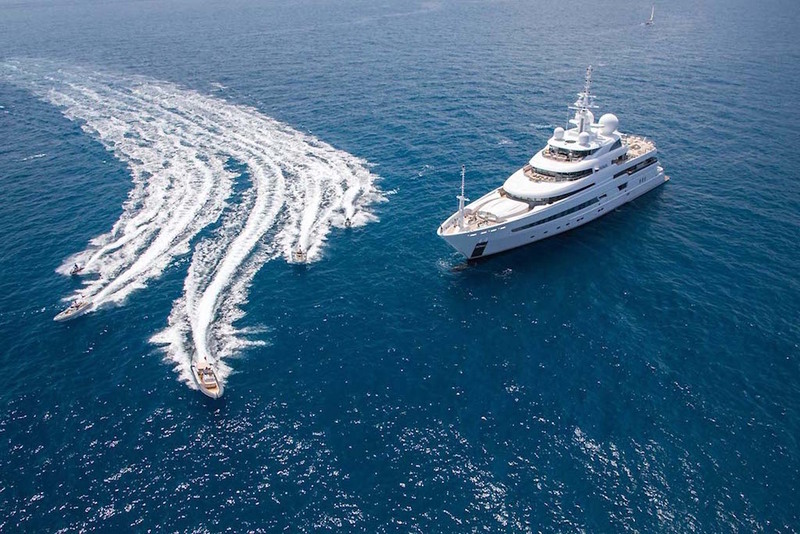 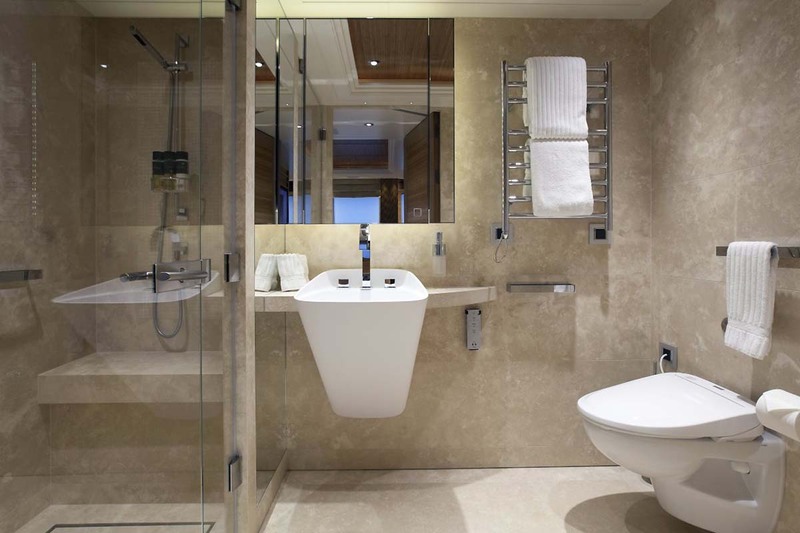 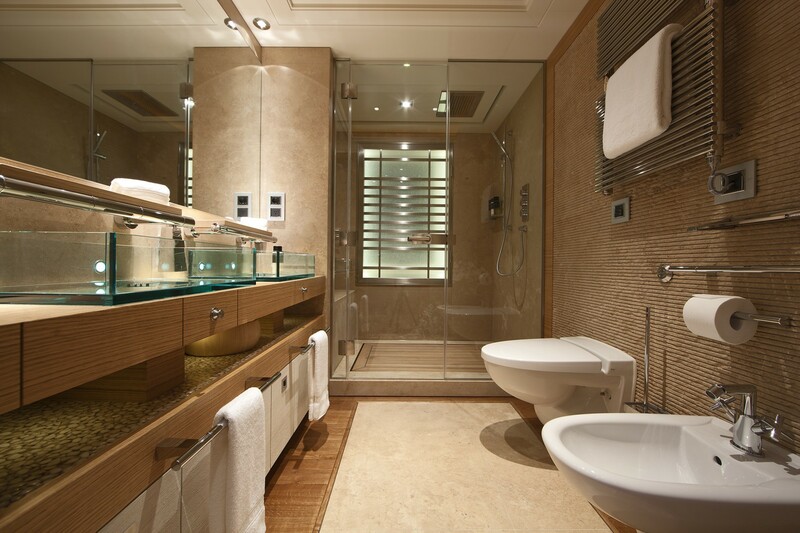 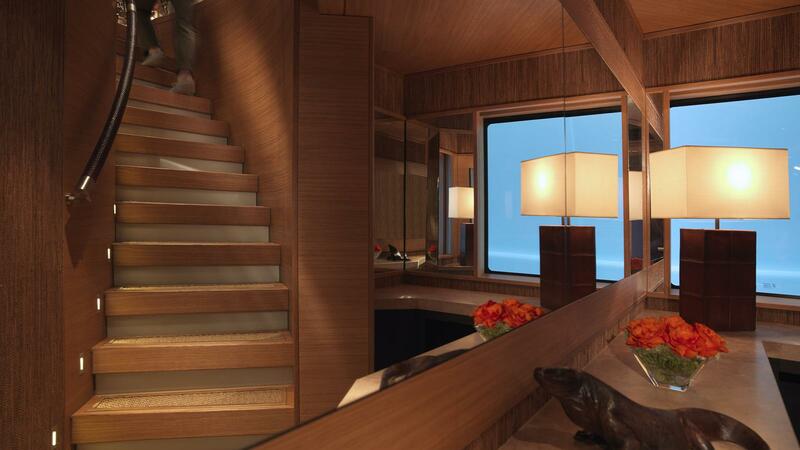 Accommodation on board of the superyacht NAIA is offered in six suites to up to 12 guests. 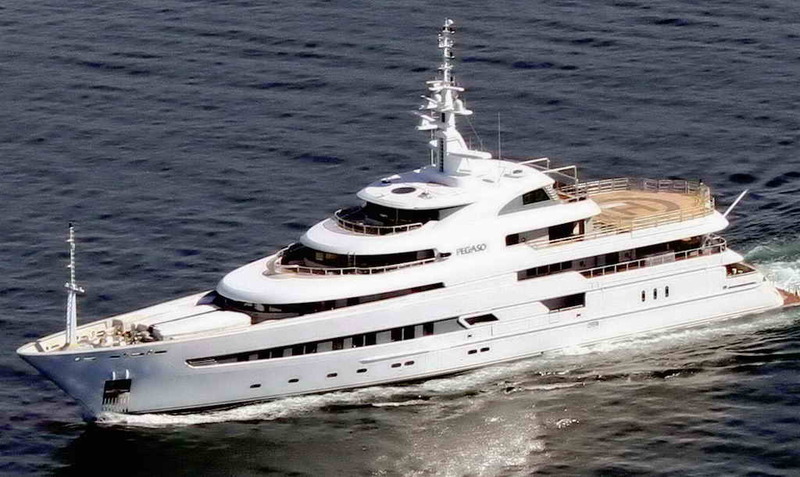 In addition, she can carry a crew of 27, together with oceanographic and marine biologist scientists. 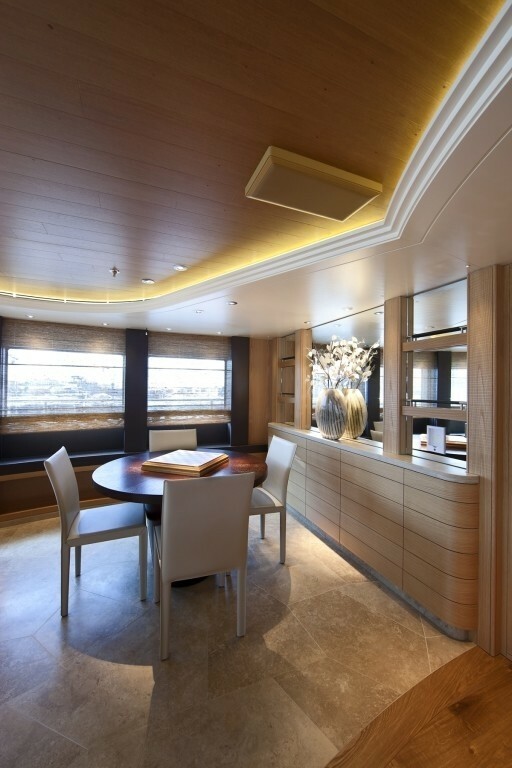 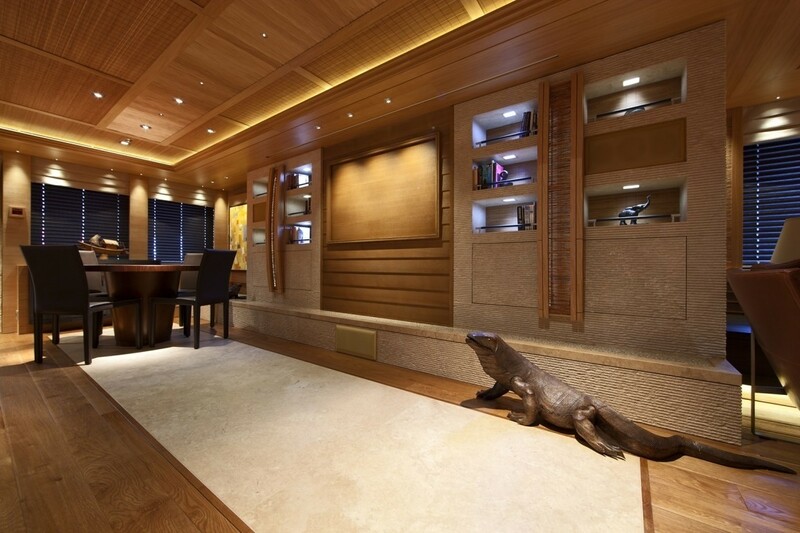 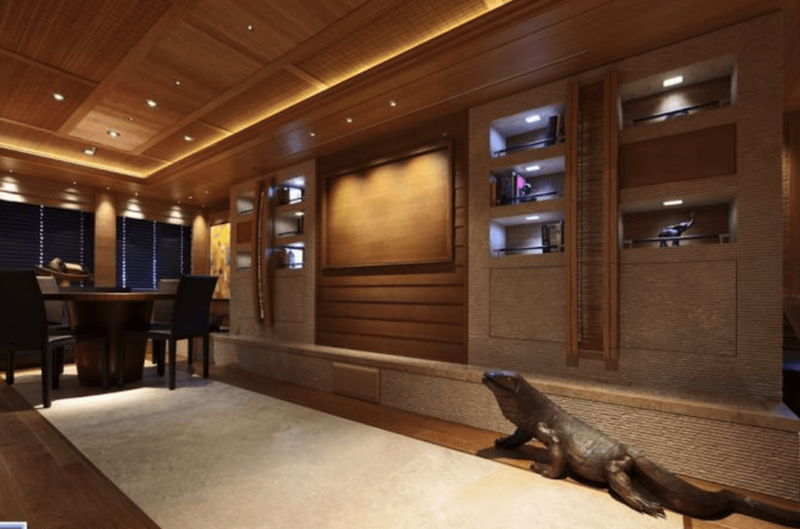 This impressive yacht features aspects resembling a glamorous luxury super yacht, more than a rugged expedition vessel, nonetheless, her unique design perfectly incorporates both aspects. 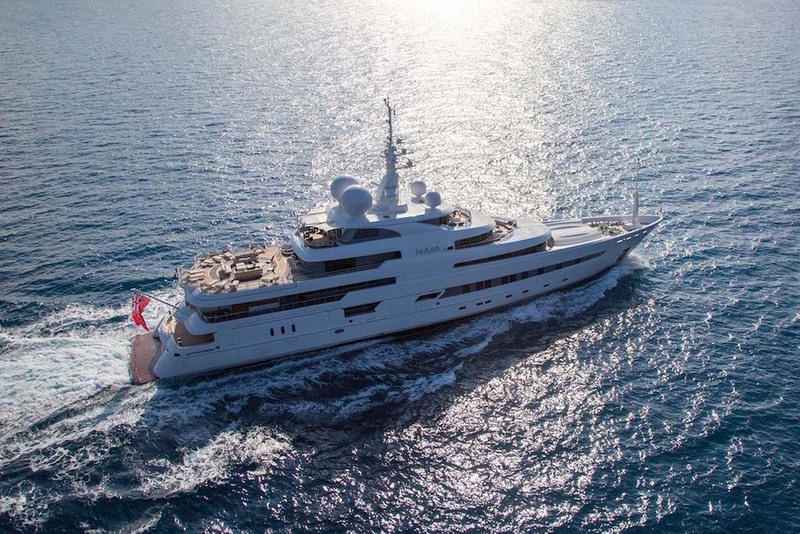 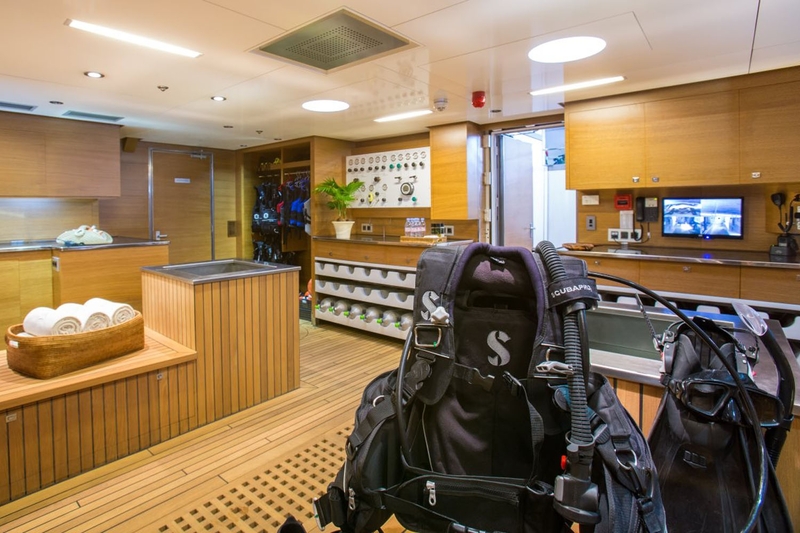 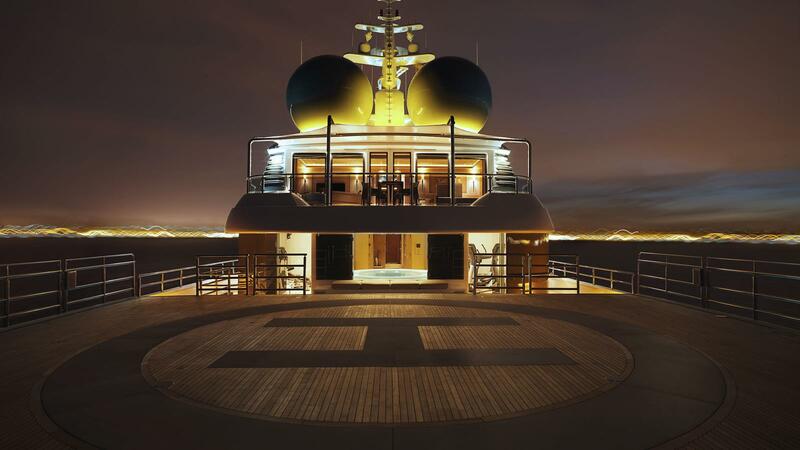 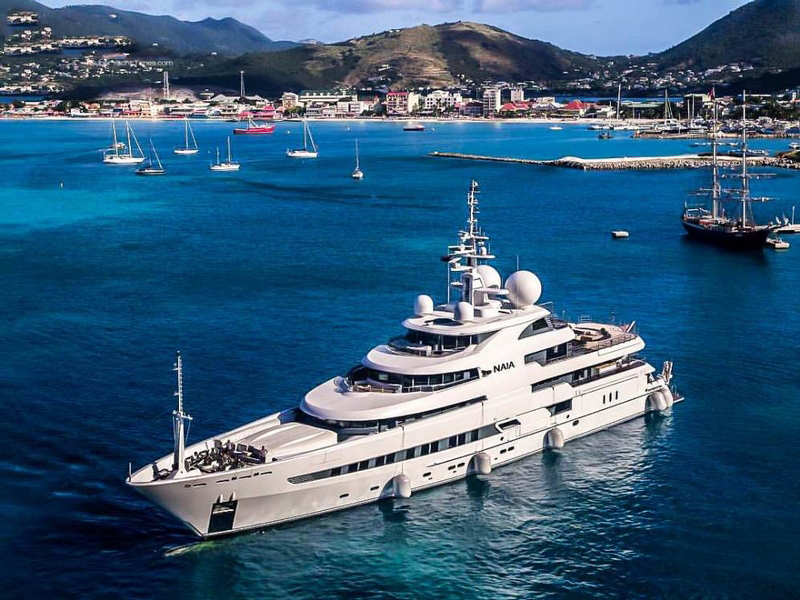 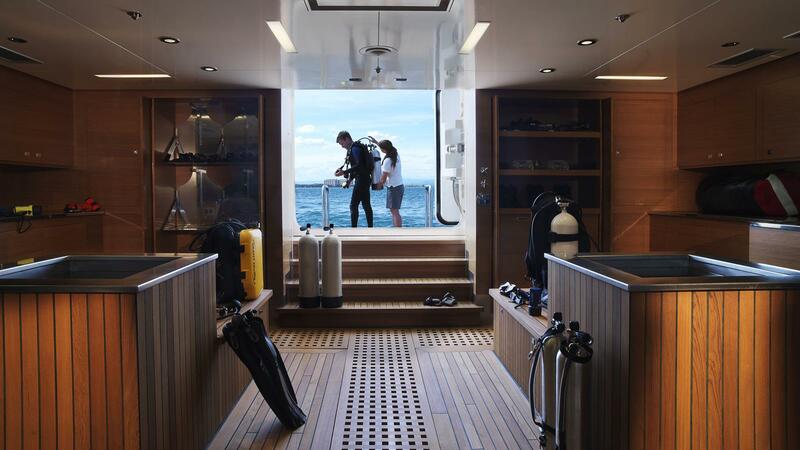 She is one of the World's largest private luxury research expedition yachts featuring some impressive amenities and 'toys' such as a 9m submarine, with a capacity for five people to dive up to 165 m deep. 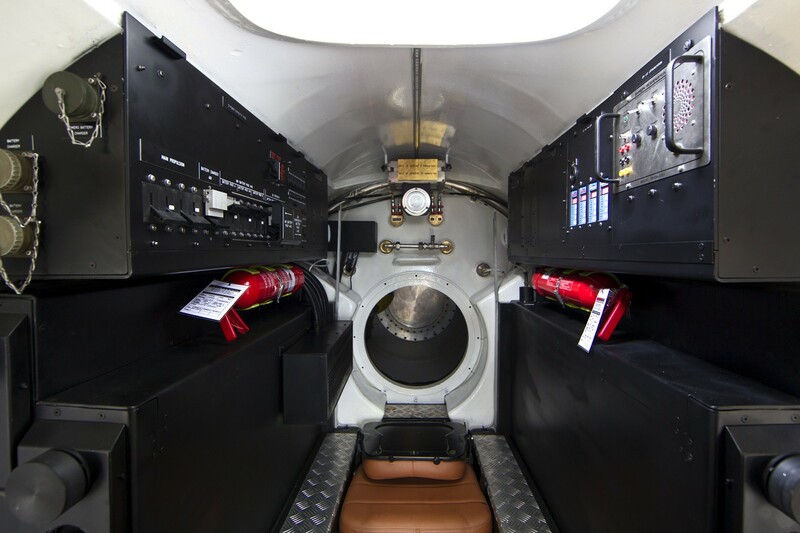 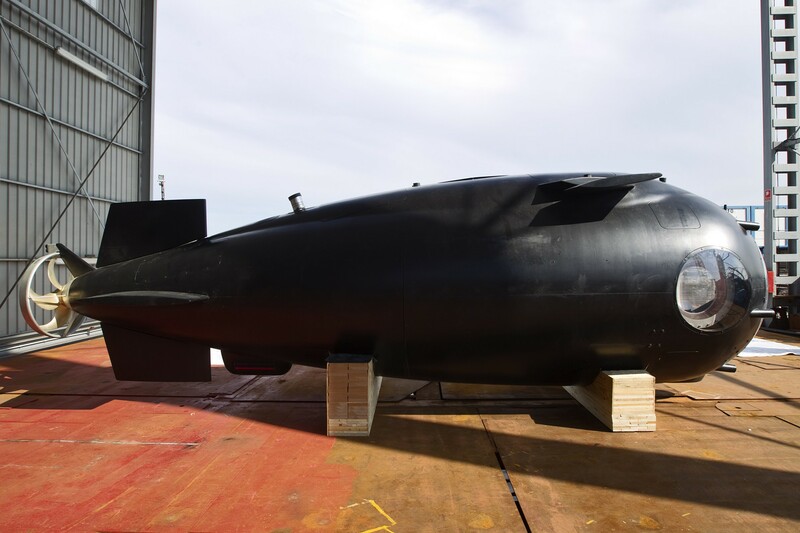 The oceanographic research submarine was built custom at an Italian Shipyard in Trieste and is housed in a 150 m square hangar on the yacht. 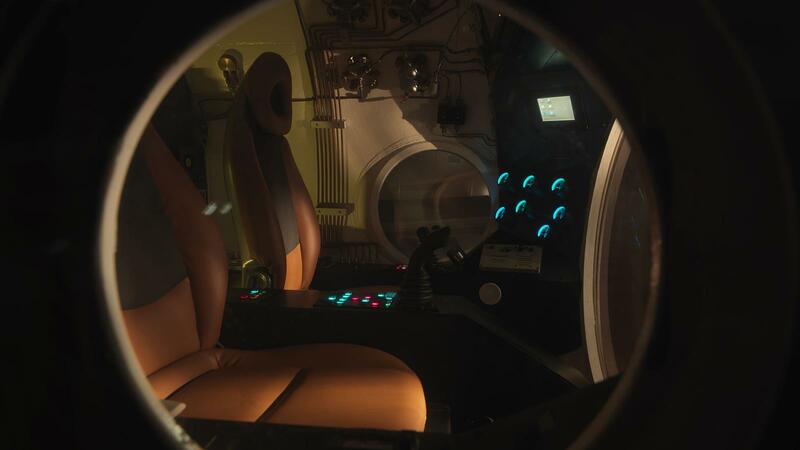 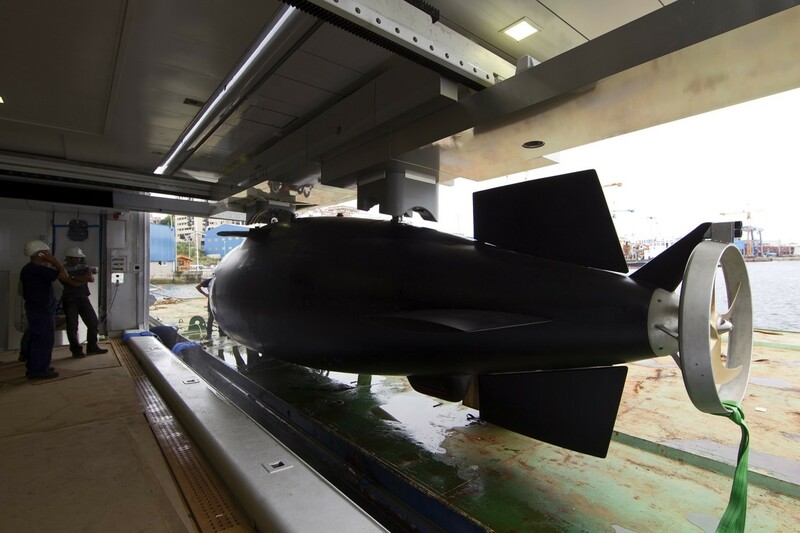 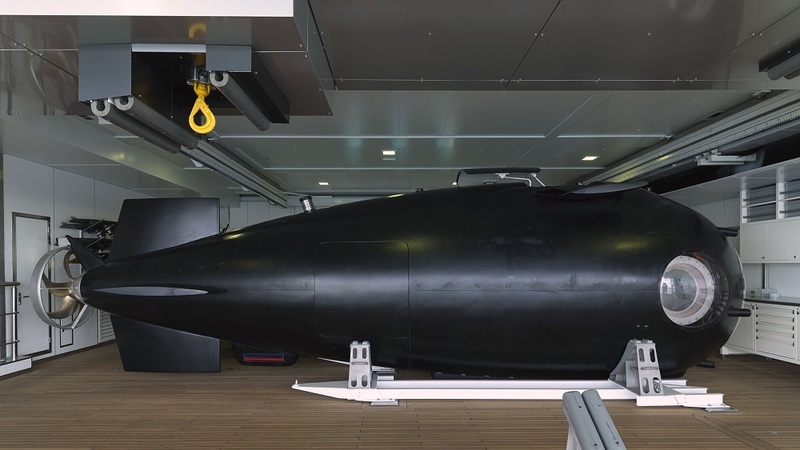 The sub is powered by electric propulsion and can reach a surface speed of 8 knots and can submerge at a speed of 6 knots. 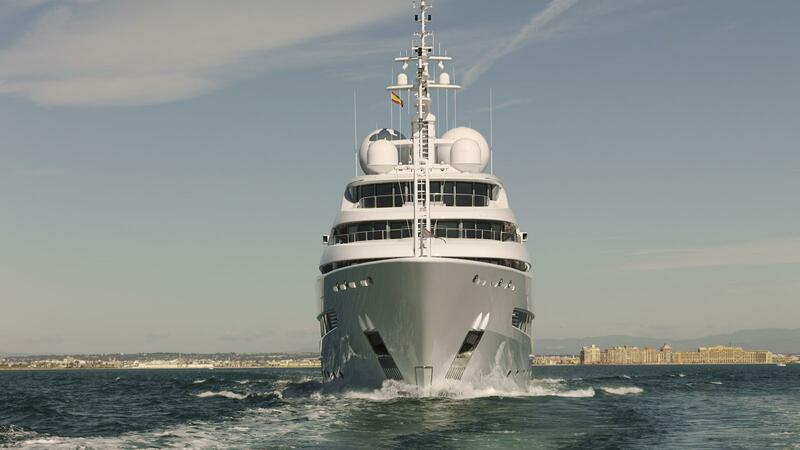 NAIA also has a huge 10,000 nautical mile range, which would allow her to cruise from Spain the Australia and back without re fuelling. 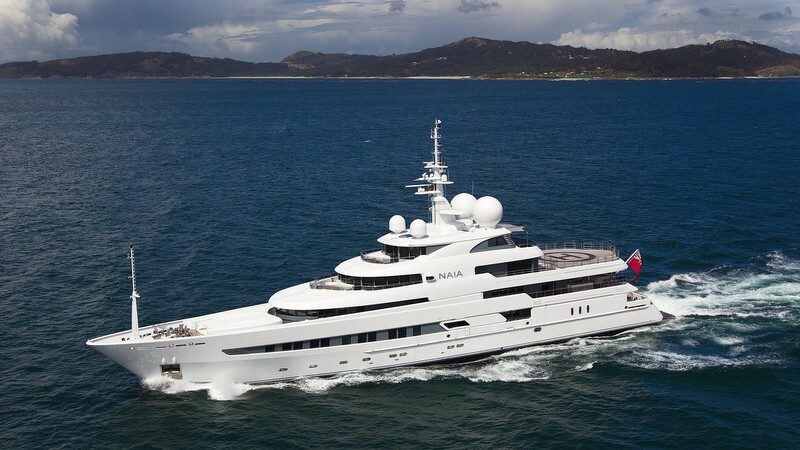 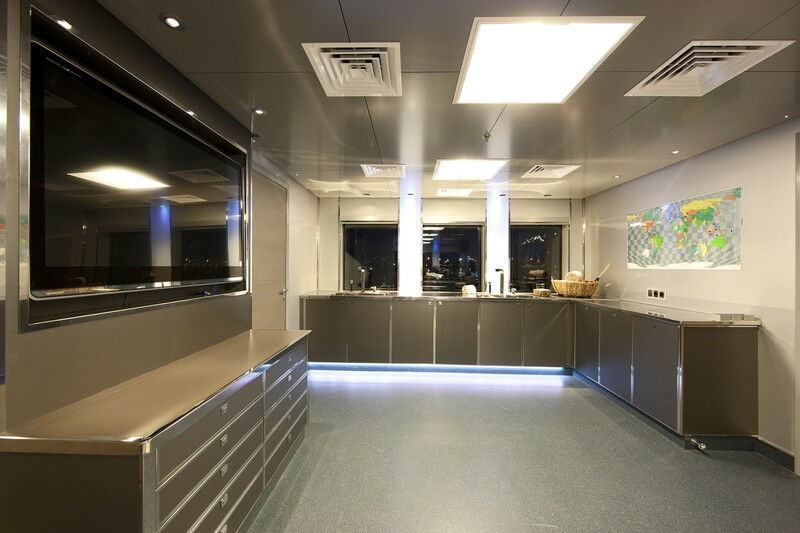 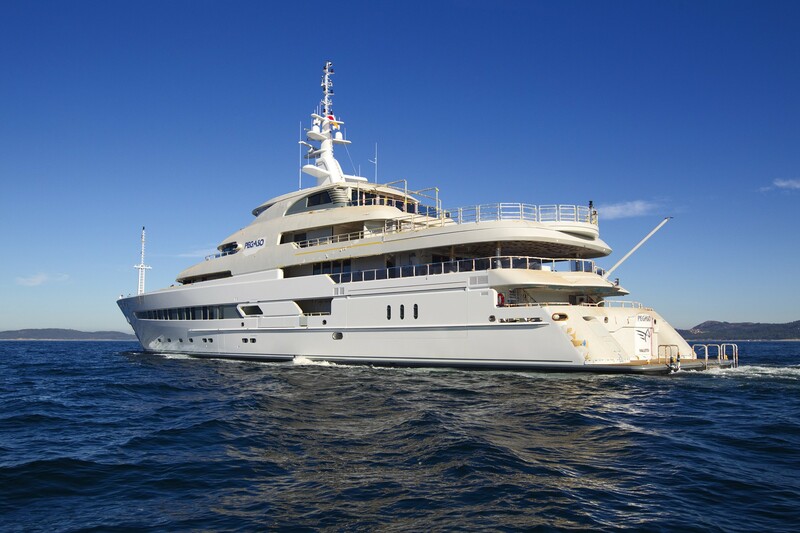 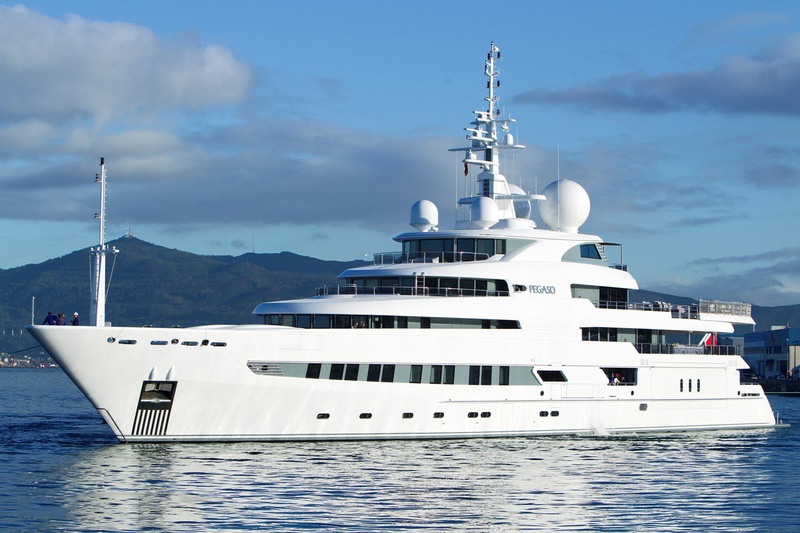 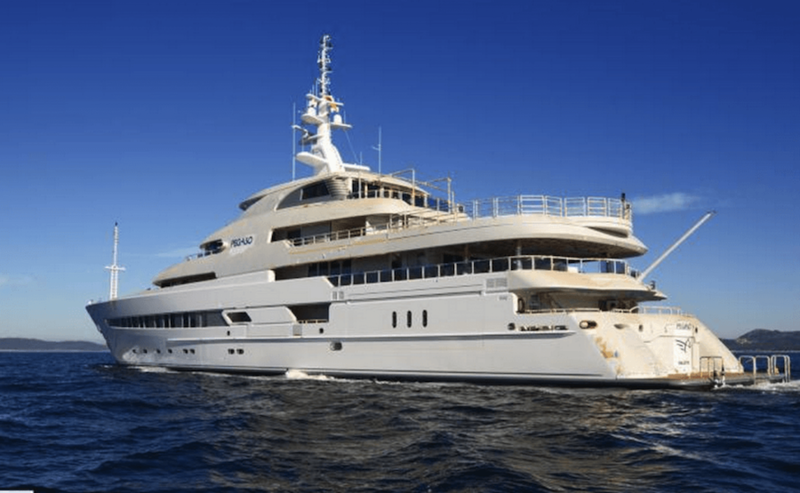 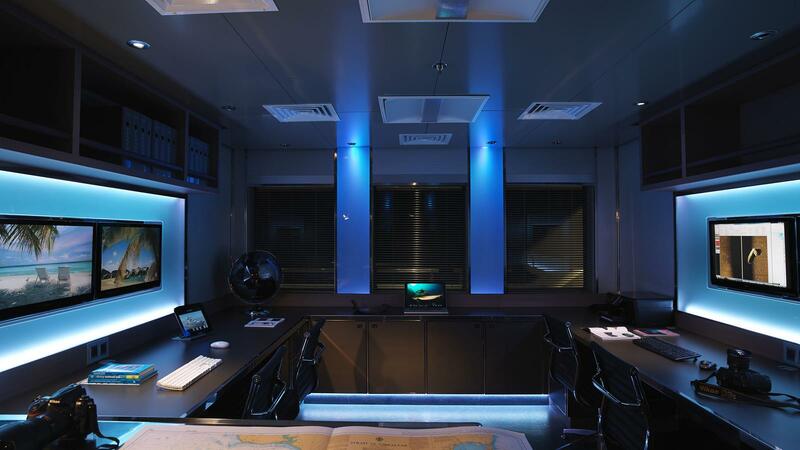 Marine research motor yacht NAIA features a steel hull with an aluminum superstructure and was built to comply to MCA and Lloyds Register standards. 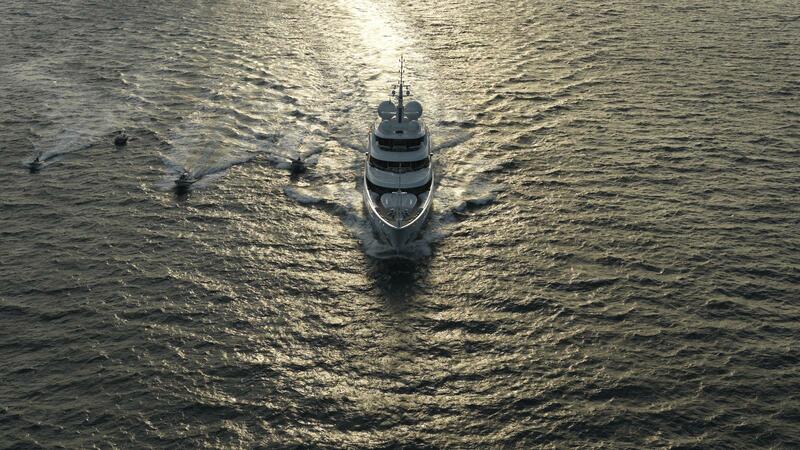 She can reach a maximum speed of 18 knots with a cruising speed of 14knots. 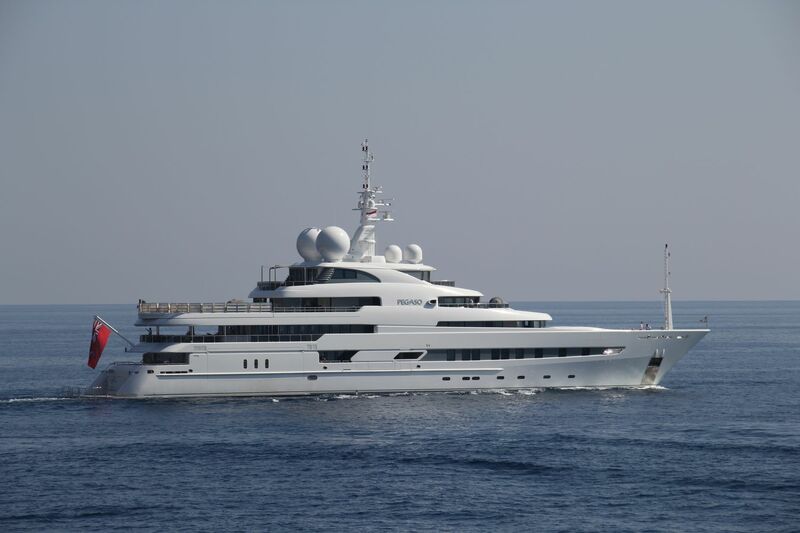 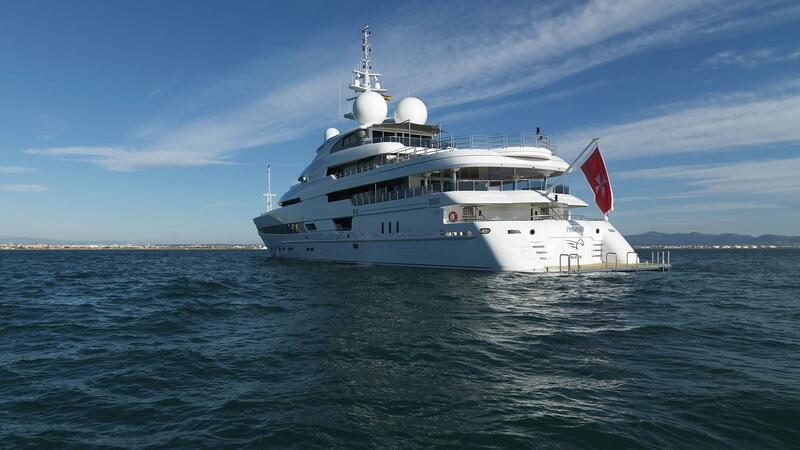 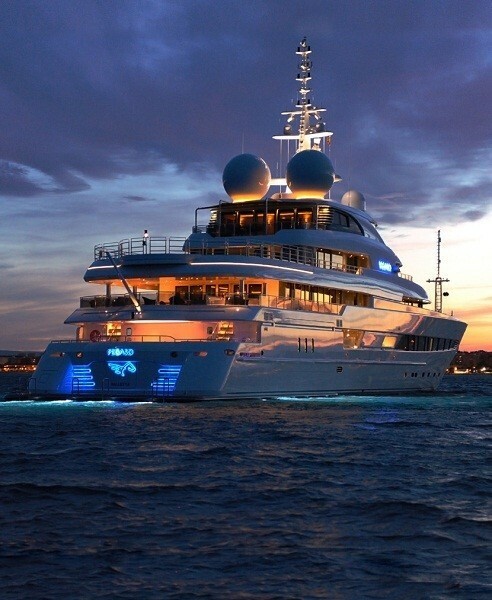 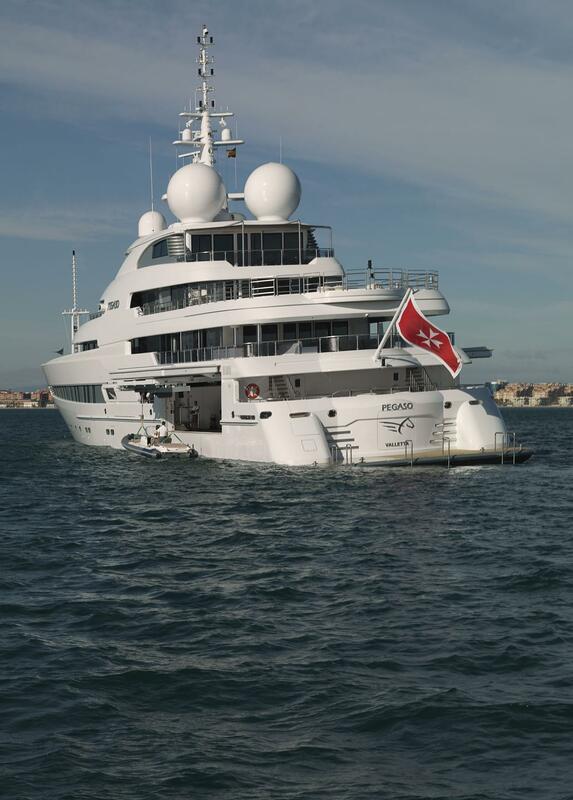 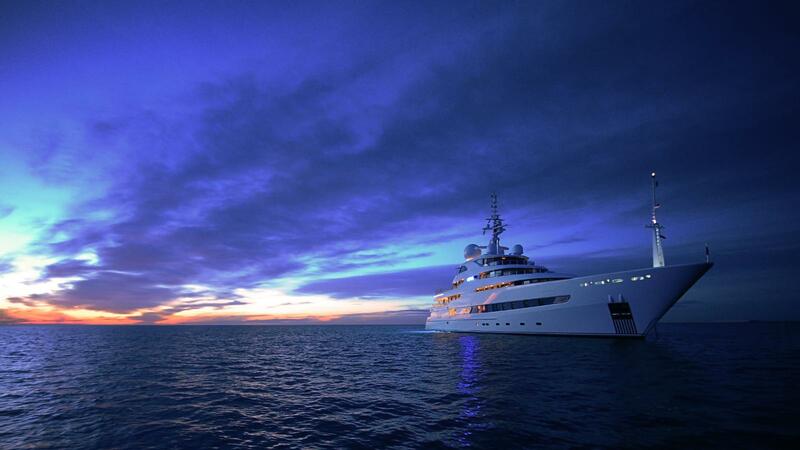 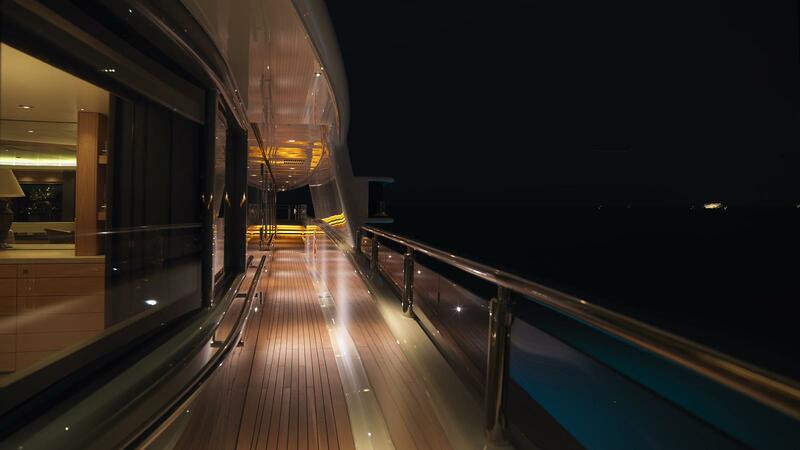 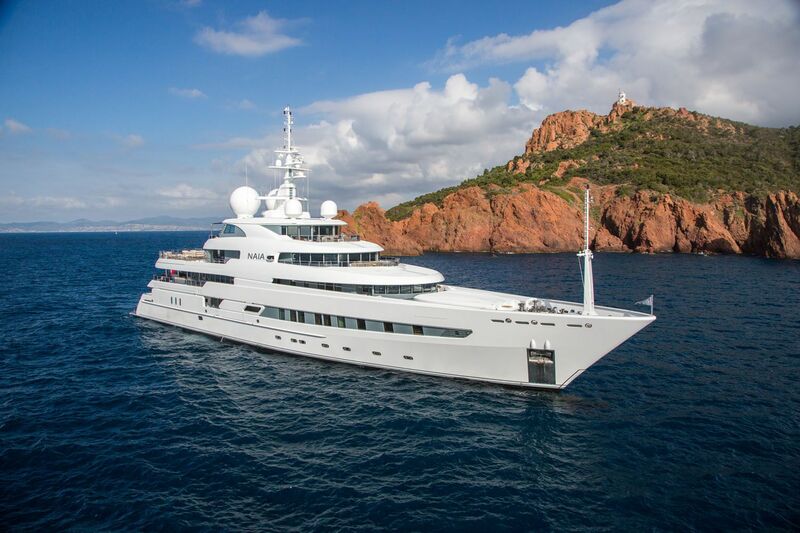 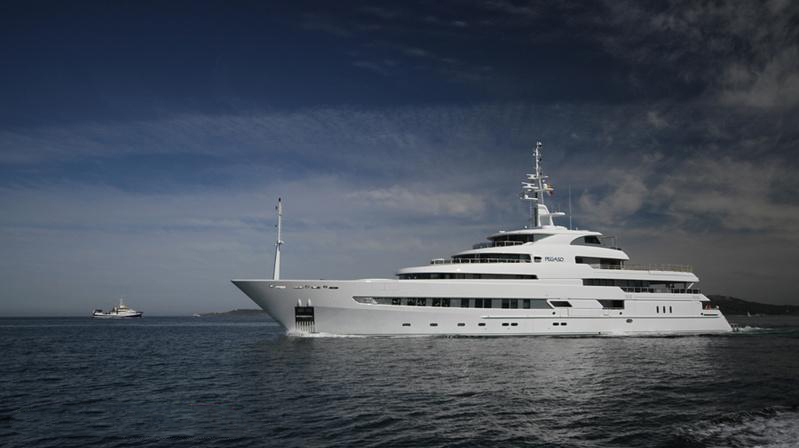 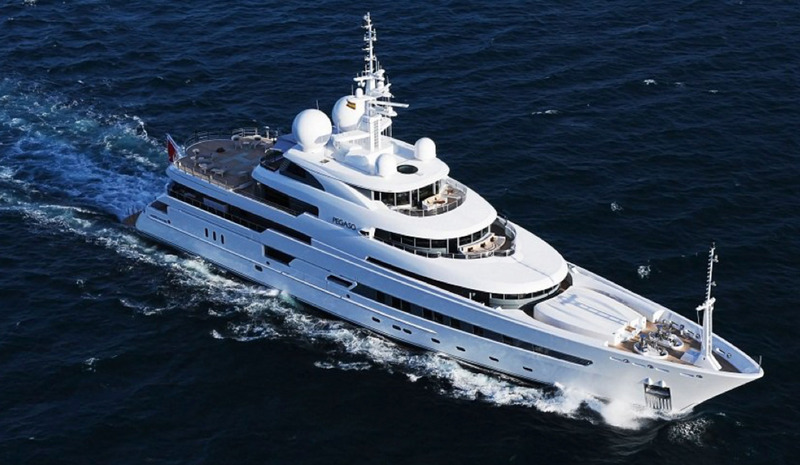 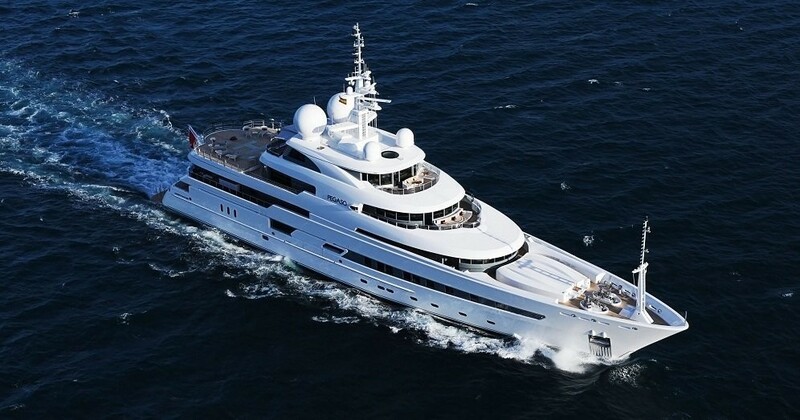 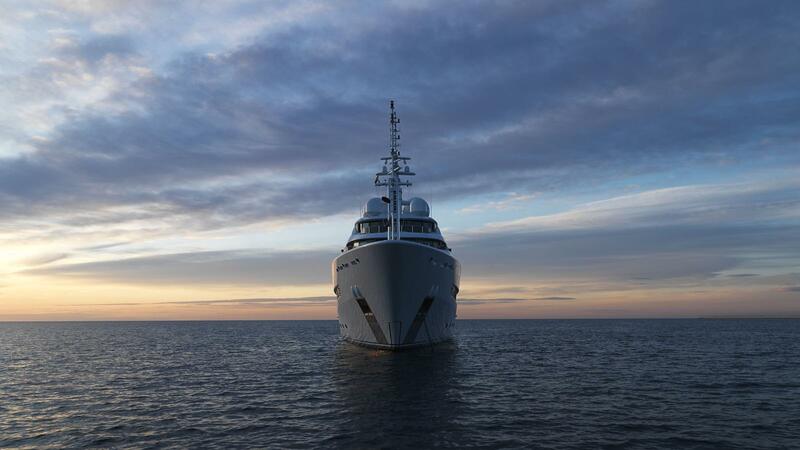 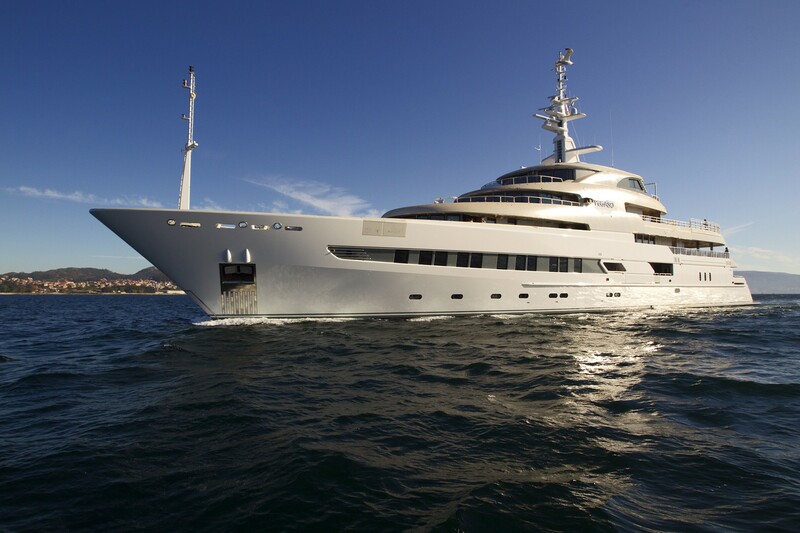 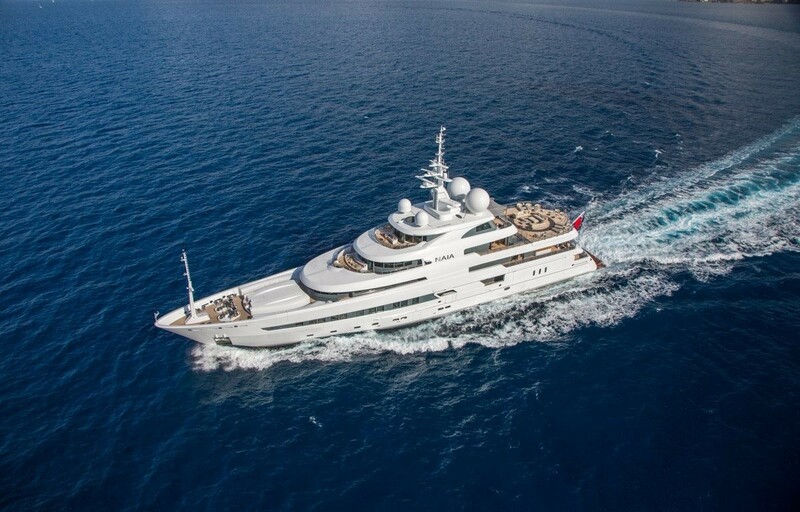 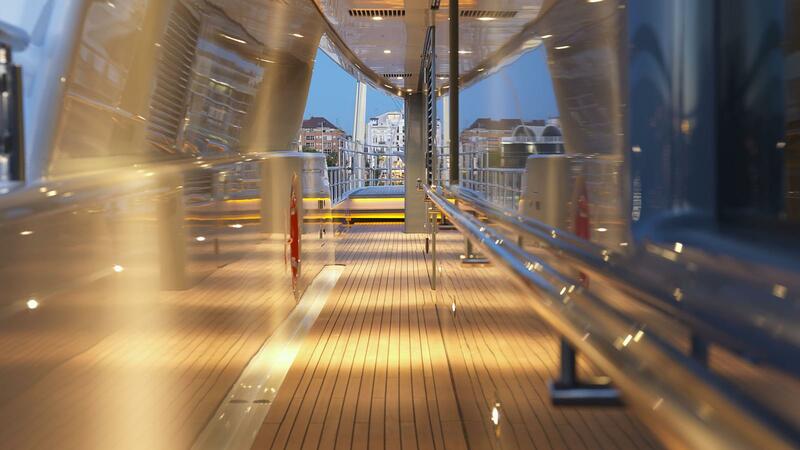 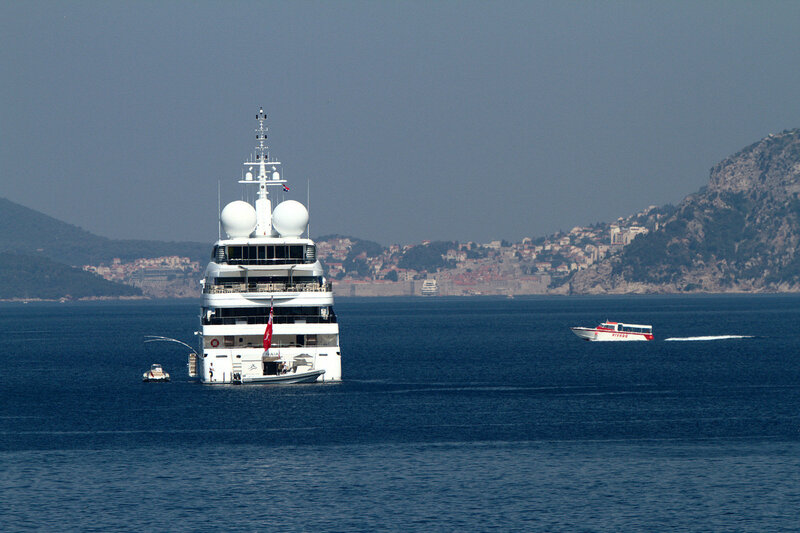 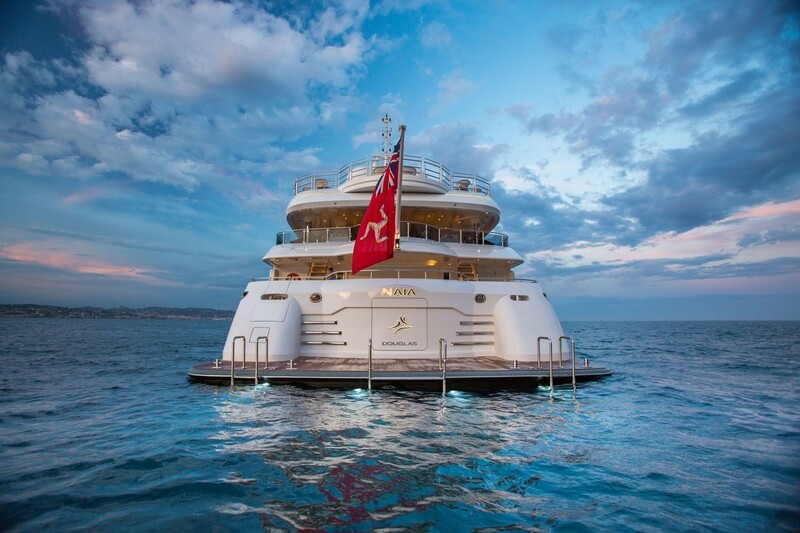 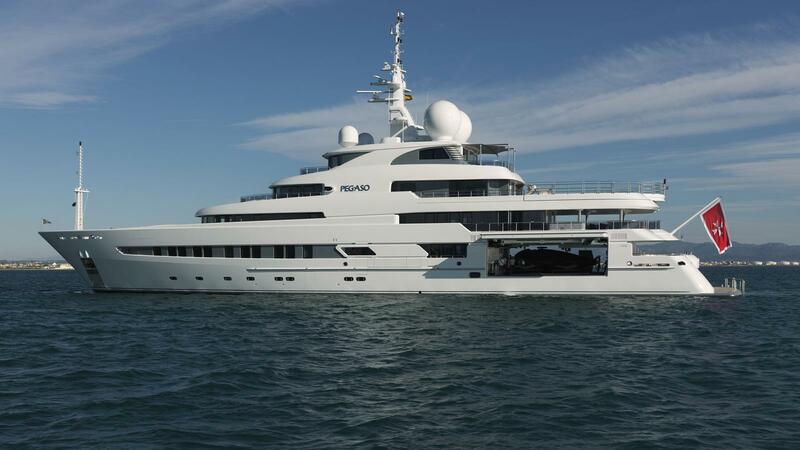 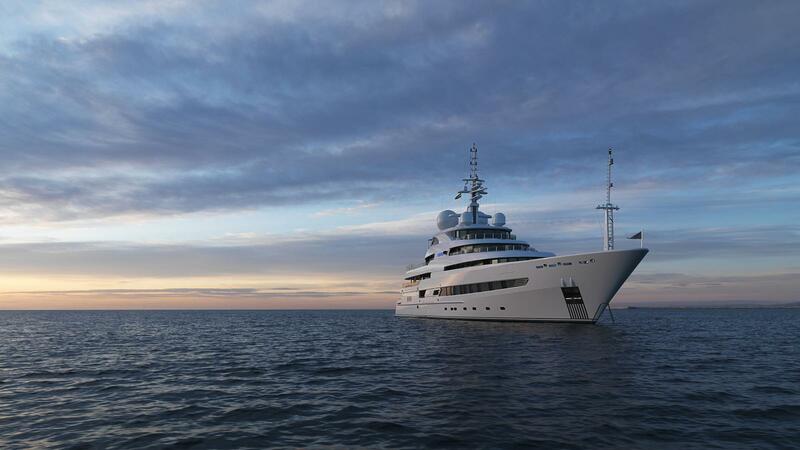 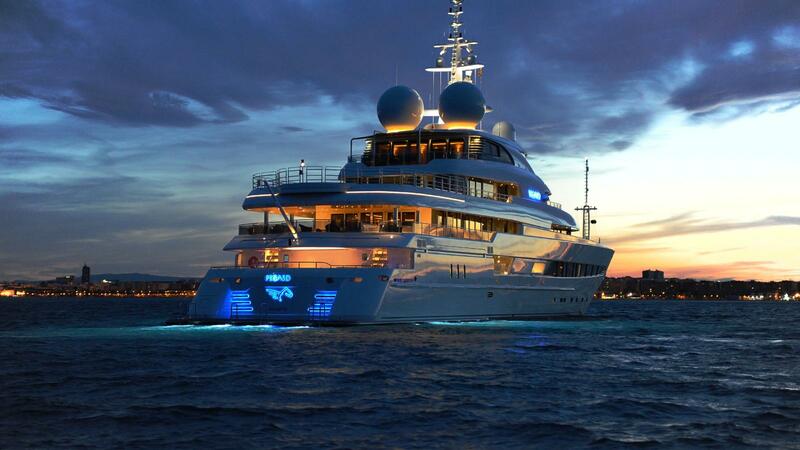 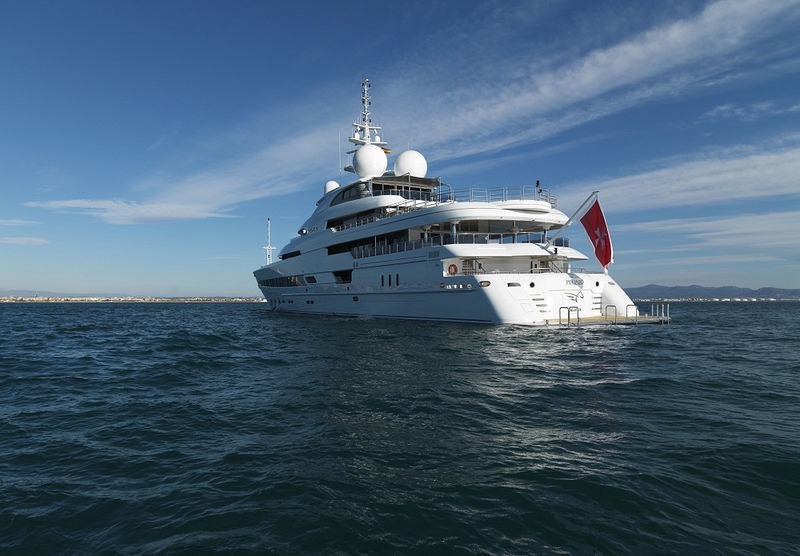 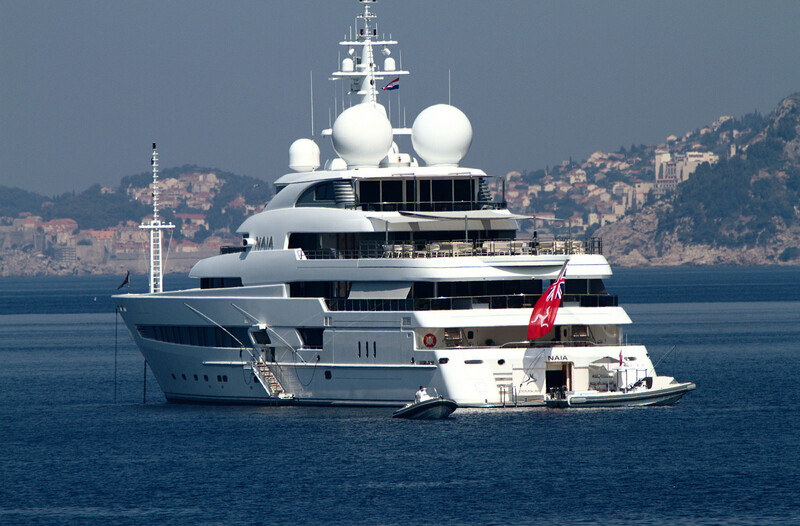 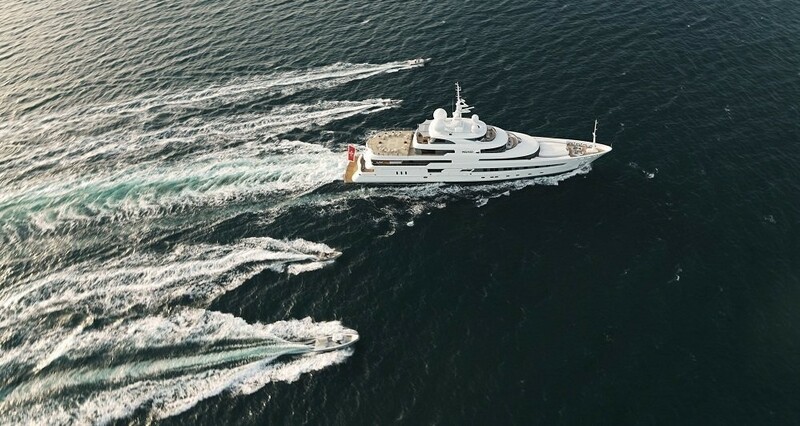 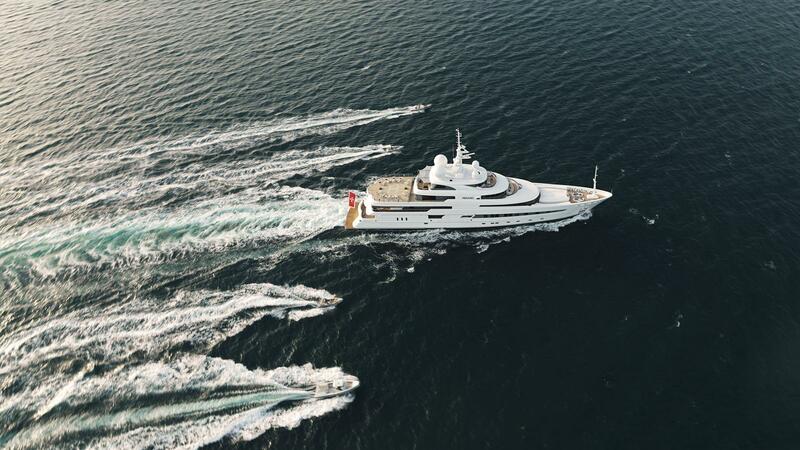 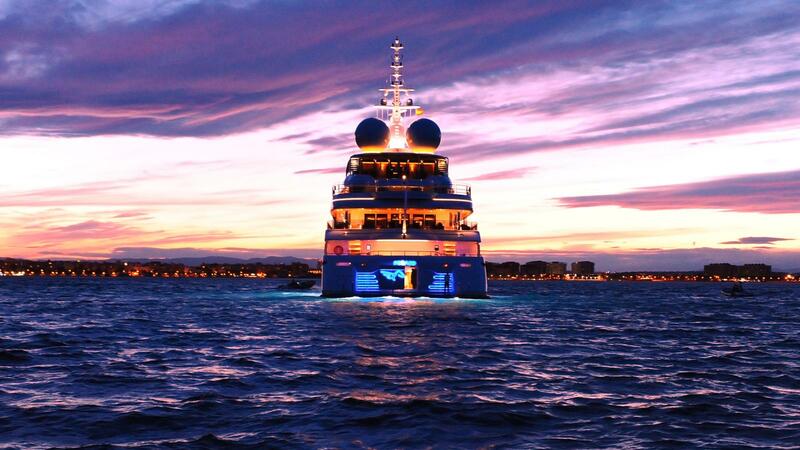 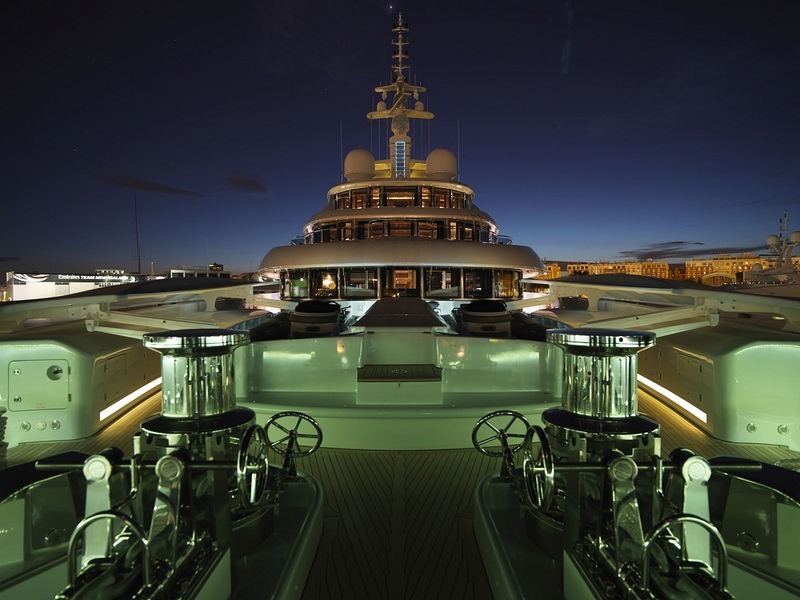 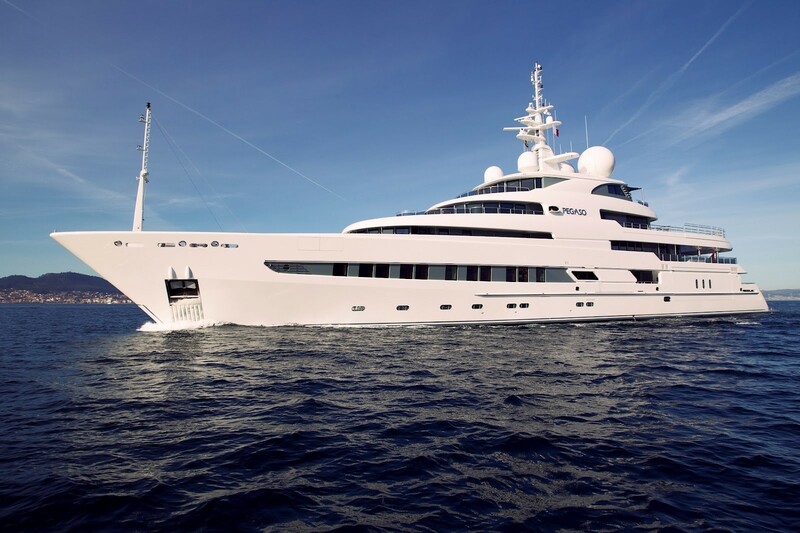 The huge 73 m vessel has a beam of 13.20m (43.31ft) and a 3.8m (12.47ft) draft providing her with a huge volume. 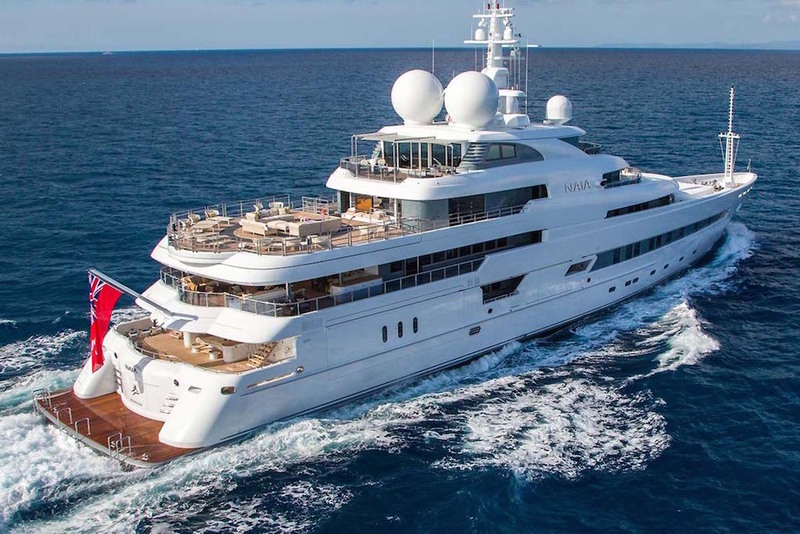 A World Class vessel with which to travel the oceans, she is as comfortable exploring the Amazon Delta as the Cote d'Azur, with a tank capacity of 10,000 miles at a reasonable 12 knots cruising speed, which would allow it to travel to places away from civilization for days on end. ICE class, Dynamic positioning, helipad, 5-person submarine and four tenders all add to the truly "go anywhere" capabilities. 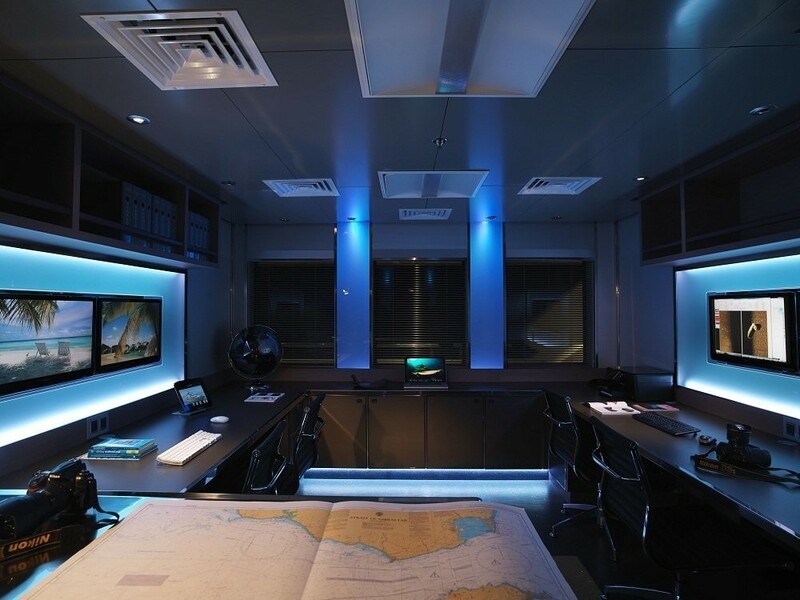 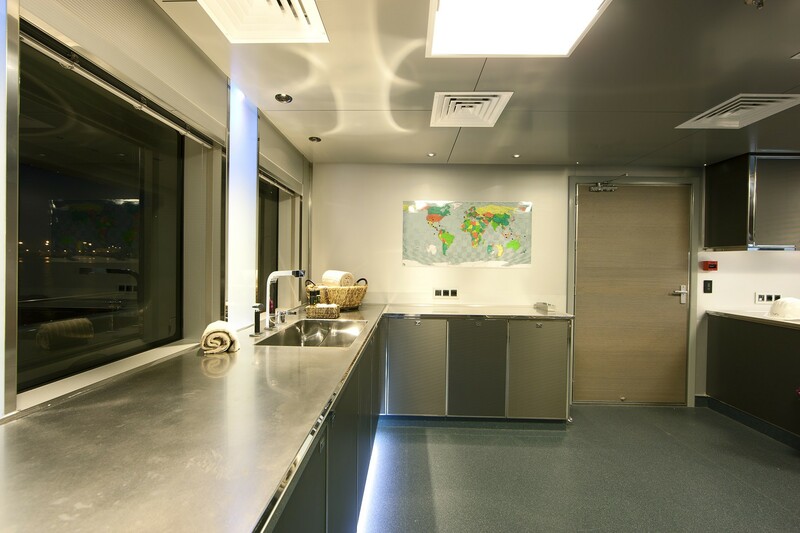 - Laboratory converted into two staff cabins. 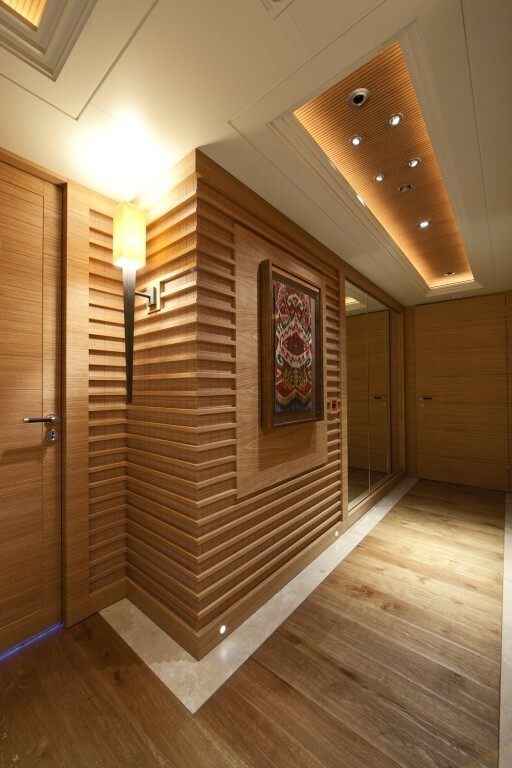 (Carpenter work carried out by Matrica, structural, piping, cabling and HVAC by Freire, multimedia by AV&IT and lighting by Aqualuce. 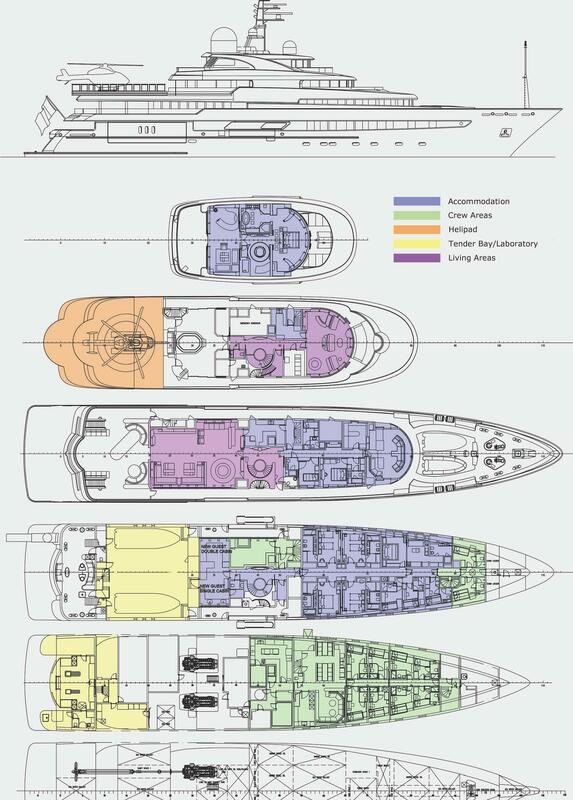 - Antifouling, anodes, propeller and rudder readings, etc. 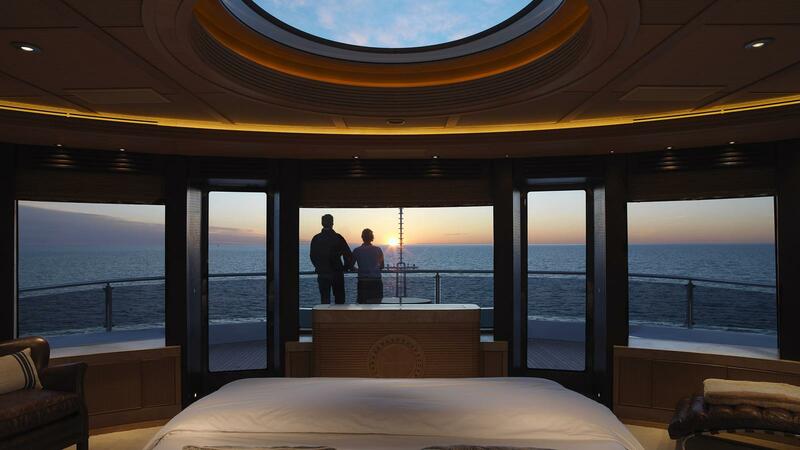 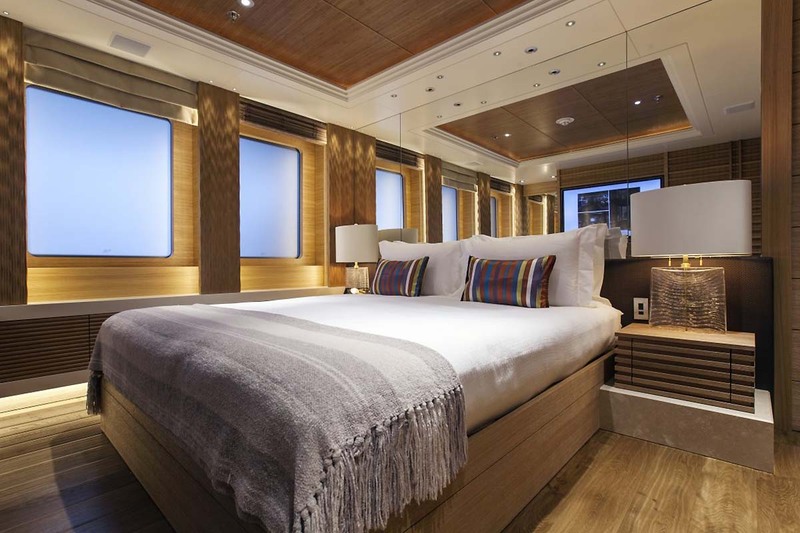 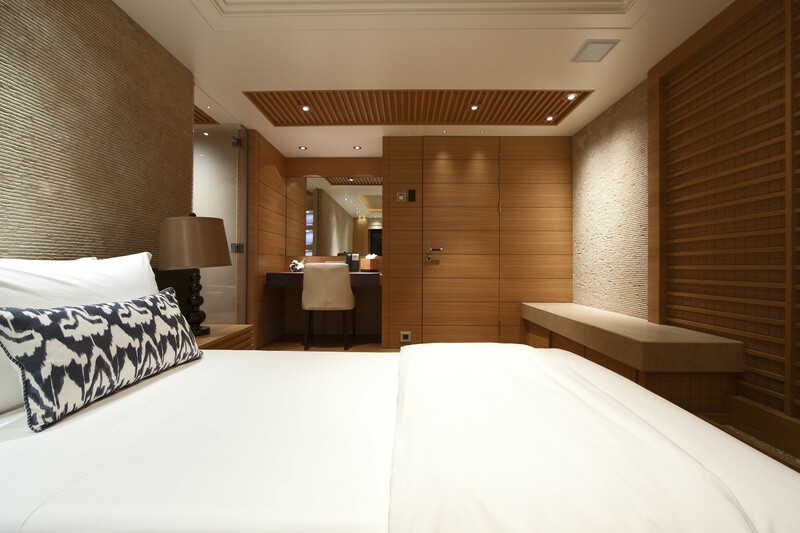 Accommodation: The master stateroom with adjacent areas for the owner is located on an entire private deck, featuring fore and aft terraces, studies and unprecedented 360° views. 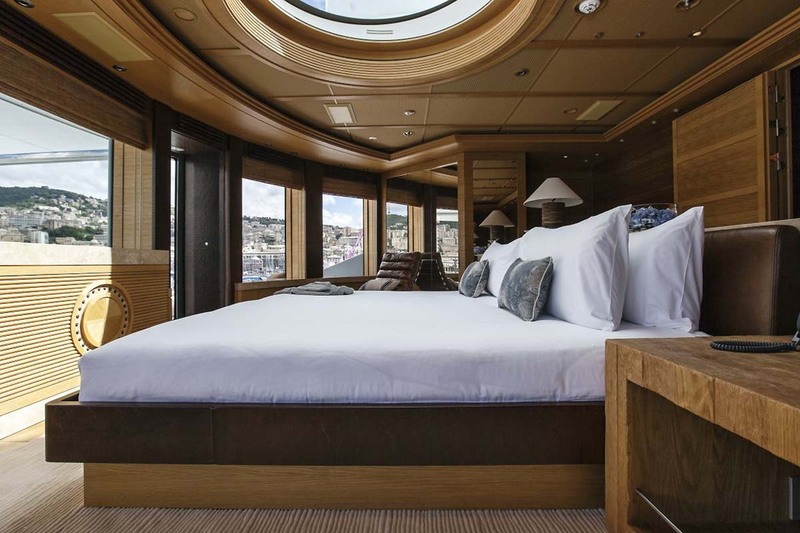 The main deck houses five guest staterooms, including the VIP suite with an Emperor bed and four double or twin King size convertible suites. 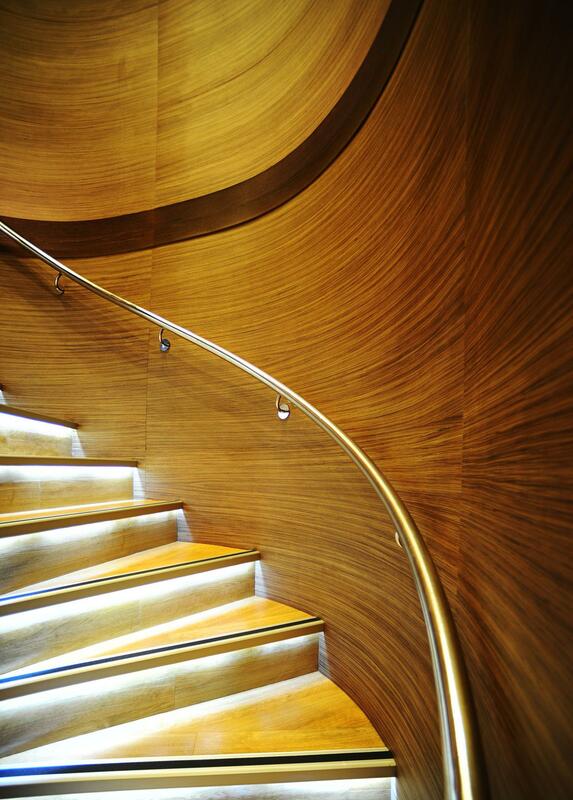 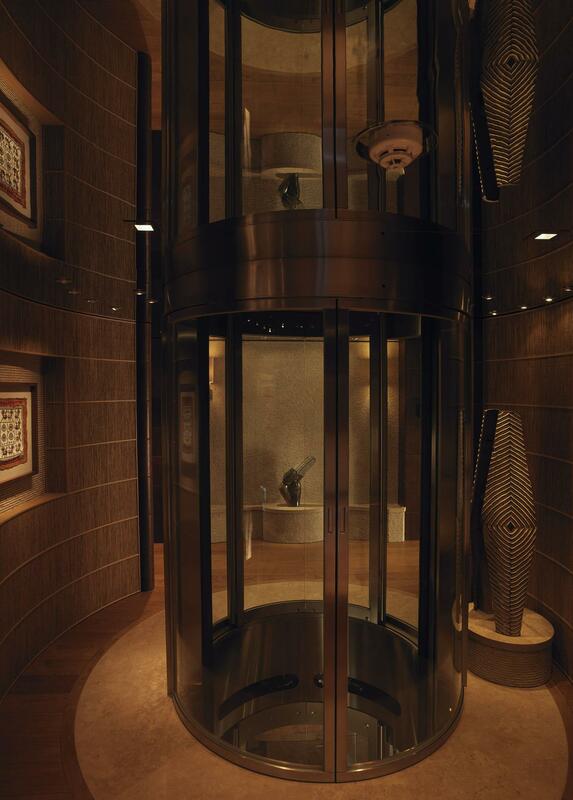 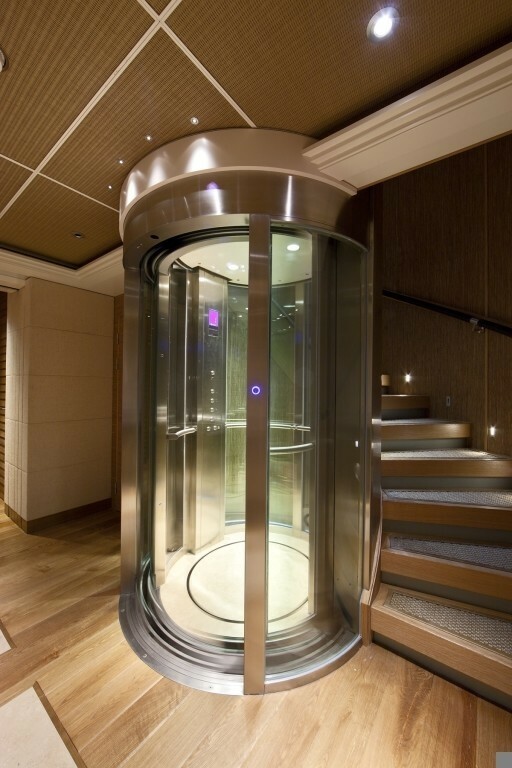 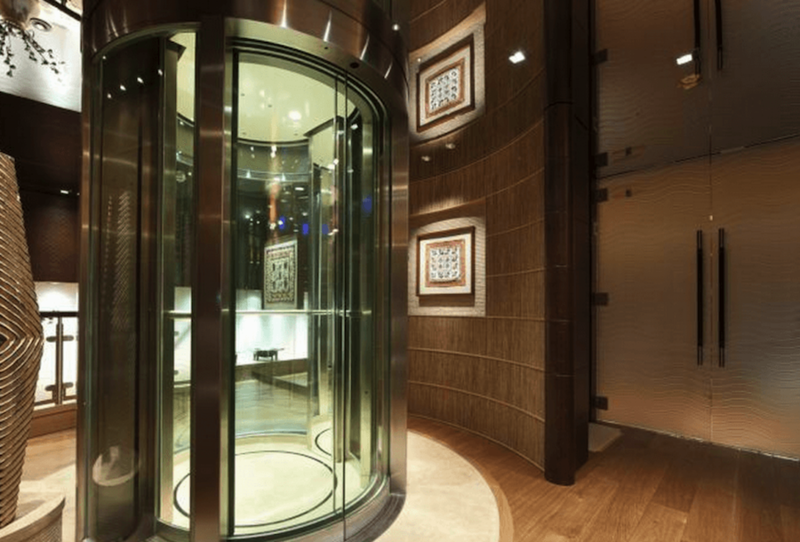 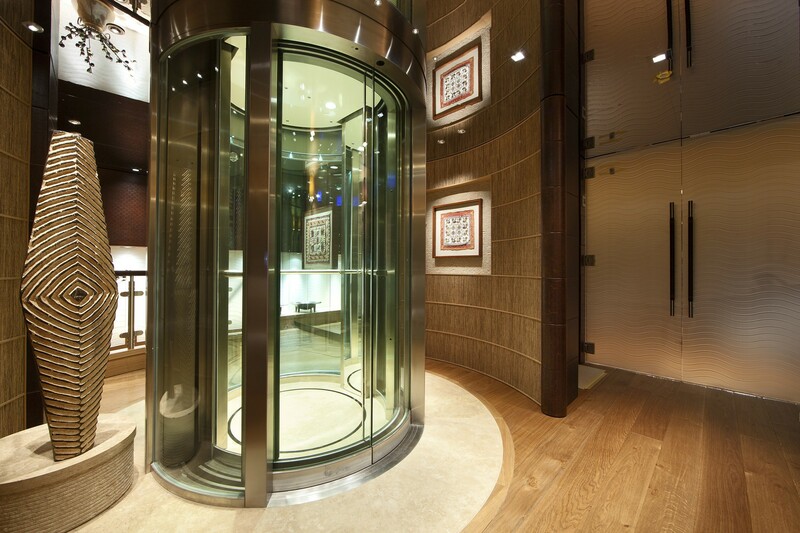 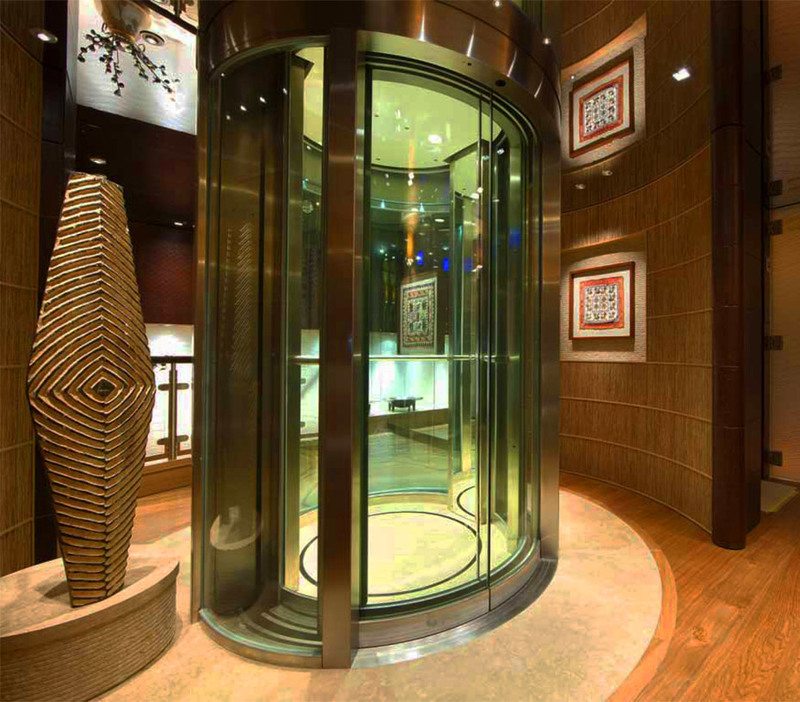 A central spiralling staircase connects all deck areas, while an elevator also connects to the master deck from the sun deck below. 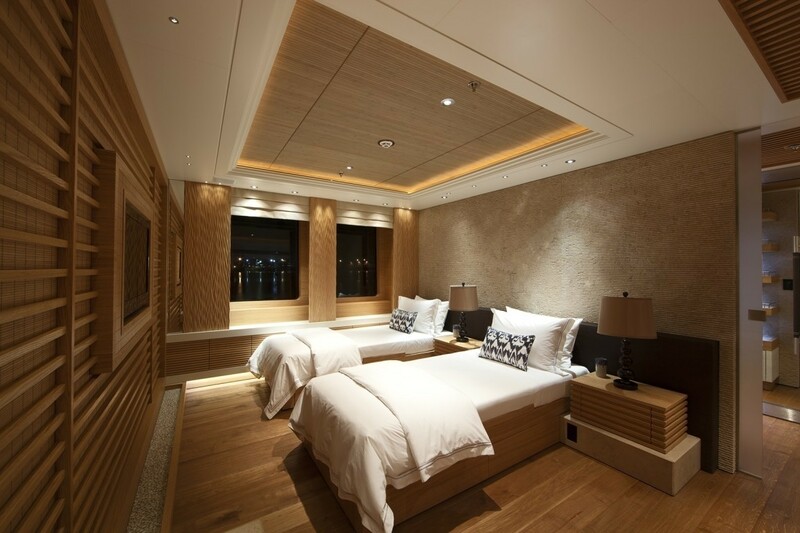 There is yet another double guest suite with a King size bed, which was converted from the old Laboratory. 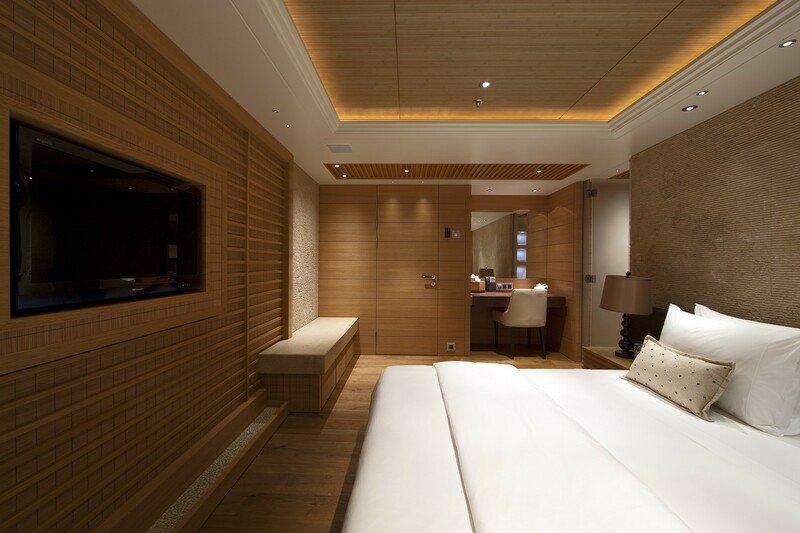 This suite also has a single cabin with a Pullman berth.